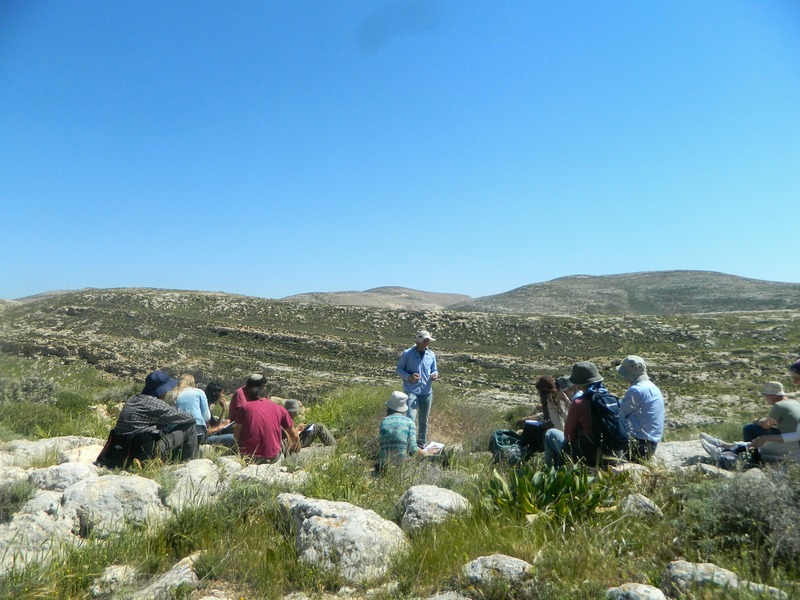 One month ago, in mid-December of last year, I participated in an adventurous field trip with fellows from Bar Ilan University. 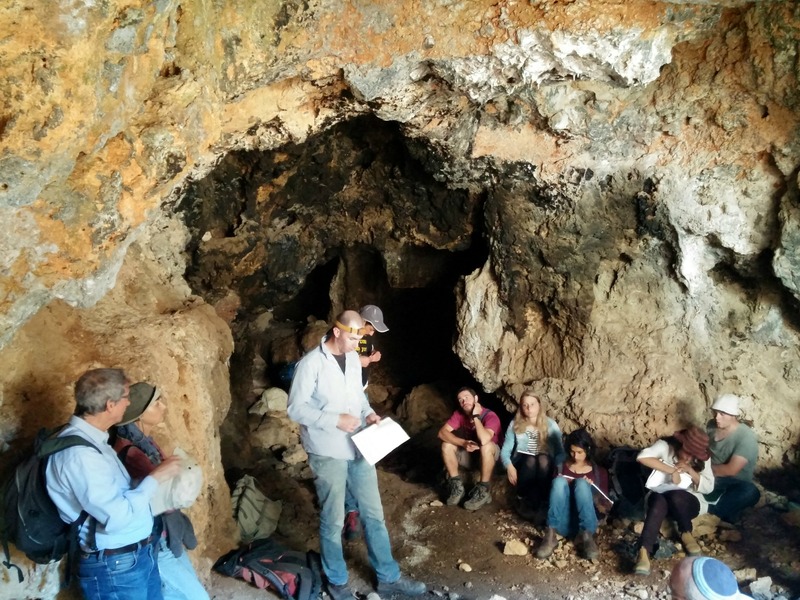 This particular trip was the first part of a field class on a range of fields including Geology, Geography and Archaeology, led by Dr Dvir Raviv. Knowing that his trips are always a great success, I signed up eagerly and I was not disappointed. 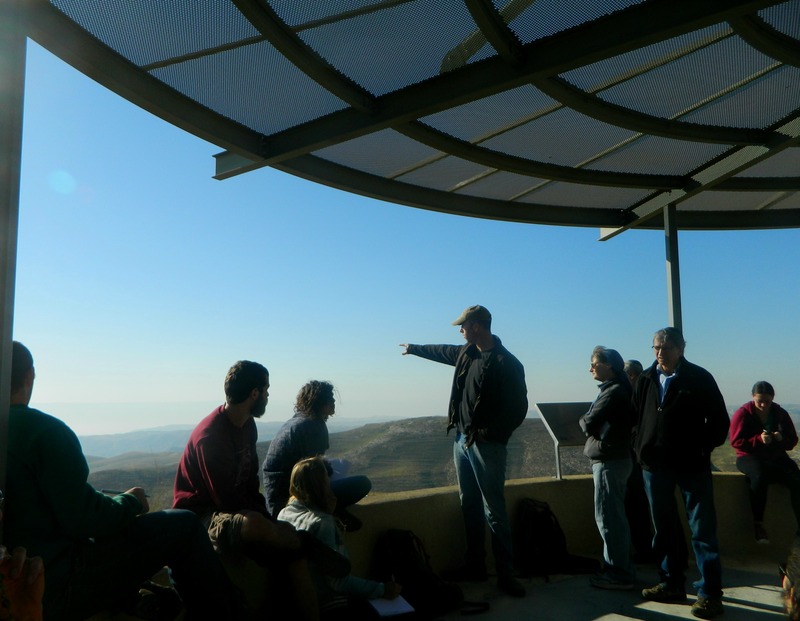 The day began at Kida, where we enjoyed a lookout over the Arab village of Duma and the eastern Shomron, learning about the geography and topography in our view. One curiosity, which only became apparent once our guide pointed it out, was a soccer field delineated by field stones, nearly indistinguishable from the nearby agricultural terraces. 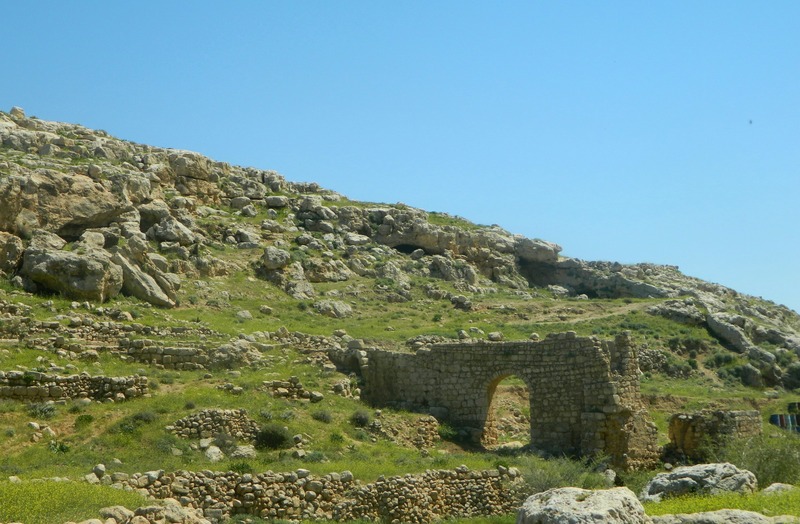 Returning to our tour bus, we were driven to our next destination, Khirbet Jib’it and its extensive ruins. 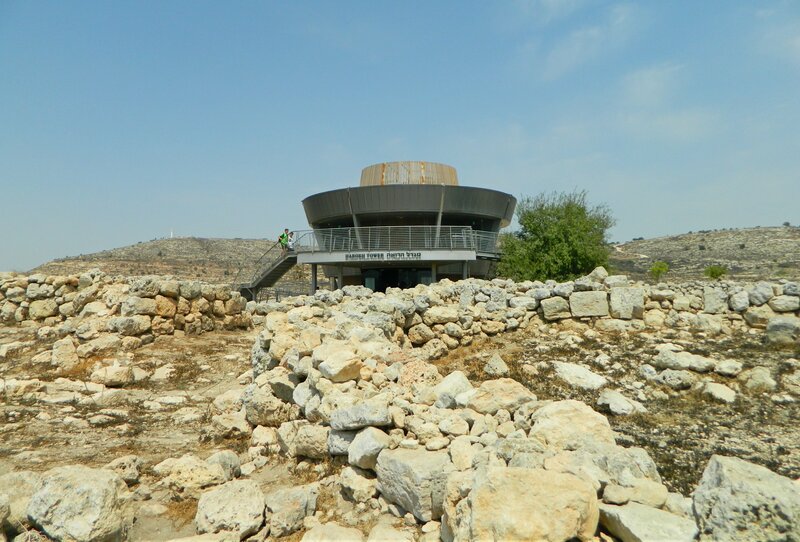 Starting from the east, we climbed the gentle hill to the top and took in both the characteristic Shomron landscape, and the sprawling ruins of crude ashlars. Crested larks frolicked in the nearby patch of ploughed land, and a lone black redstart hopped from rock to rock as we learned about the site and the archaeological advancements made over the years. Our last stop at Khirbet Jib’it was to the Byzantine church on the northwest corner of the site’s main hill. 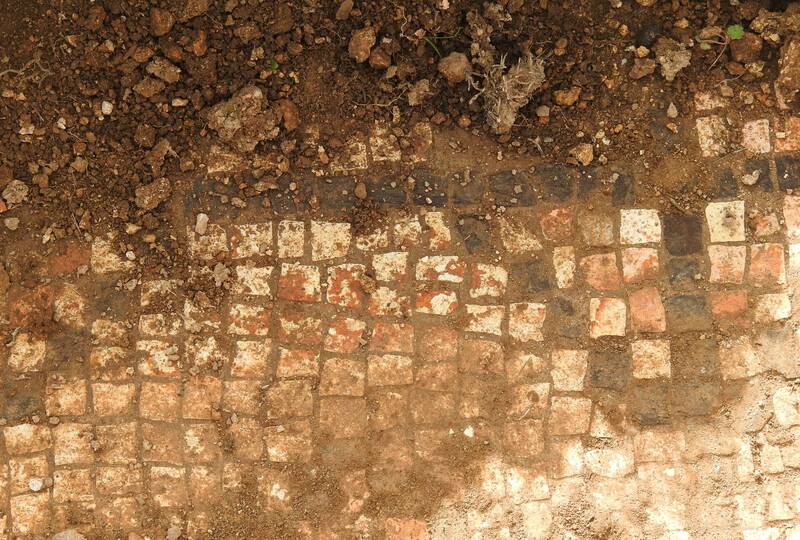 There, among the local Bedouin sheep, we found some of the church ruins as well as a bit of a newly exposed mosaic. A short walk downhill on the ancient road took us to our waiting bus and then onto the next site. Pulling over at the side of the road some twenty minutes later, our bus dropped us off near an obscure archaeological site called Khirbet el-Marajim. 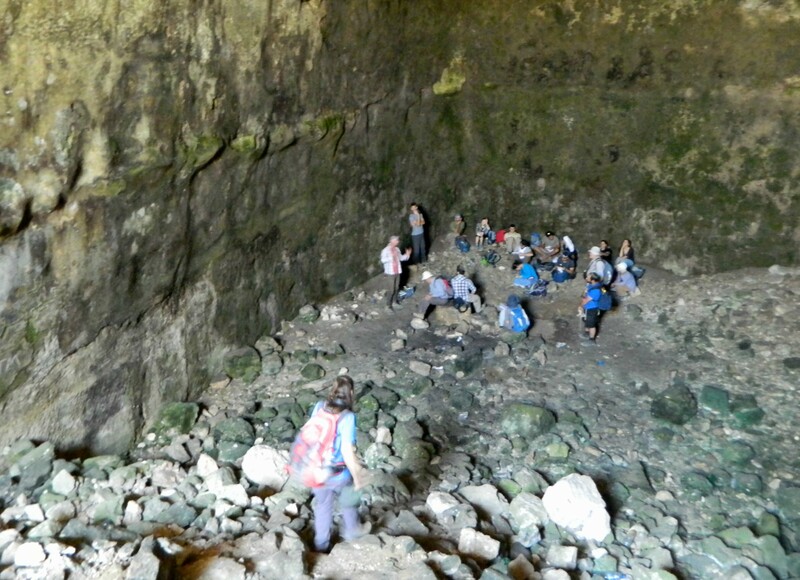 After a five minute walk, and we were at the outskirts of the site, one of the sharp-eyed members of the class picked something off the ground: a rock with a trigonia fossil. 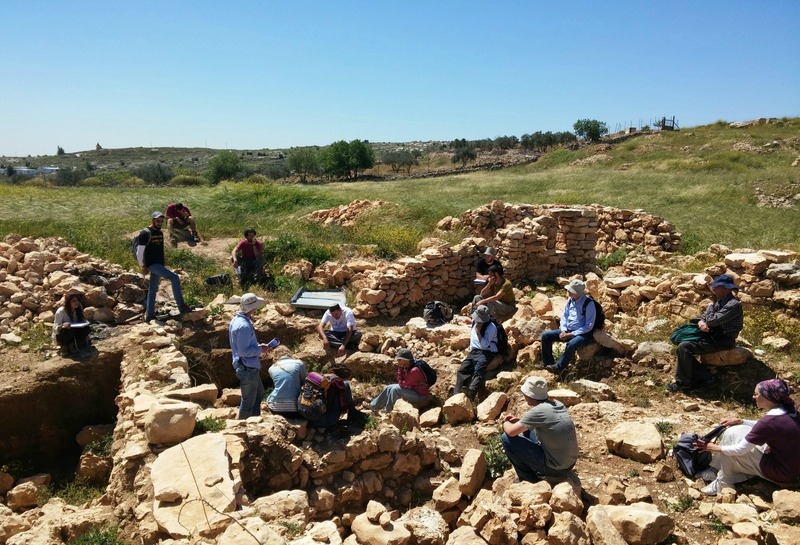 Within minutes we were gathered around the main attraction of el-Marajim: a large excavated pool with a partially collapsed tower from an earlier period in one corner. Nearly hidden, yet plainly in sight, are the entrances to an underground hiding complex from the Roman era. A quick look at those, and some explanation on the site and we were off to the next part of the trip. 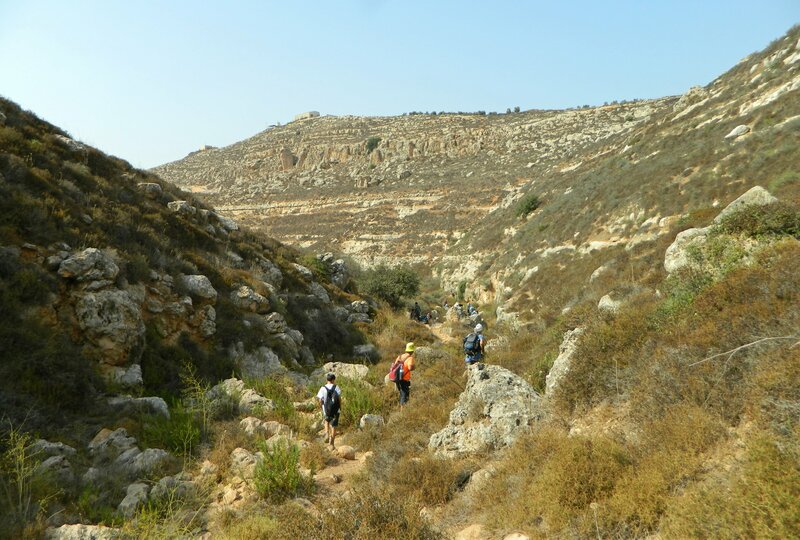 We hiked down from Khirbet el-Marajim towards the nearby wadi, through the characteristic Shomron terrain and towards the stream that bears the name of this post. It only took fifteen or so minutes before we entered a very different area – from the terraced green slopes to the boulders of the streambed. We stood at the dry waterfall, where just a large pool of cold water remained from the seasonal rains, and surveyed the land before us. 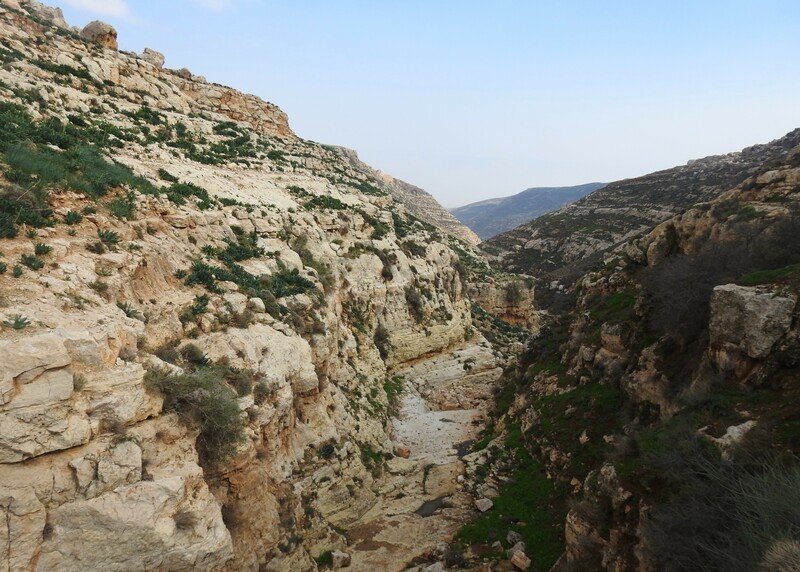 A deep canyon opened up, revealing what would be Nachal Rash’ash, and the two sides reached up higher than before. 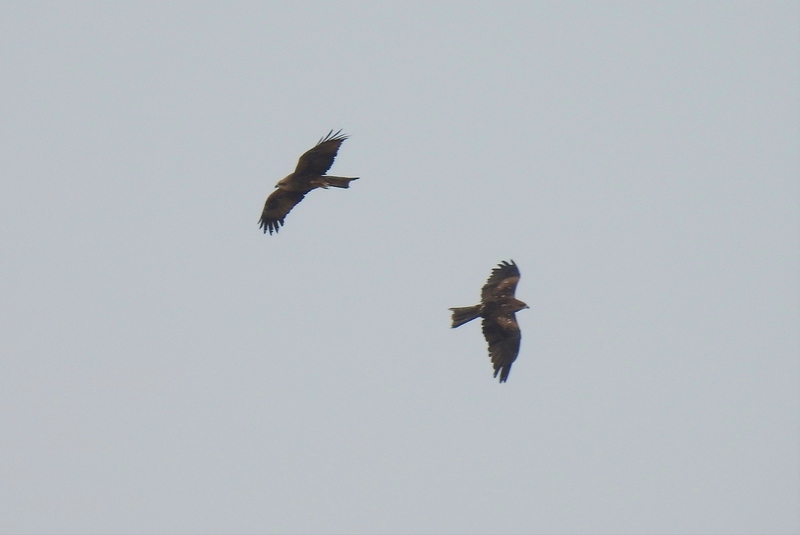 Several black kites soared overhead relatively low, perhaps hoping that one of us would fall into the ravine and become their next meal. But, alas (for the carrion-eaters), none of us slipped and we set out on the trail, progressing along the somewhat muddy southern slope. While the hike felt slightly treacherous, the views were breathtaking and our quick pace kept us rightfully occupied. 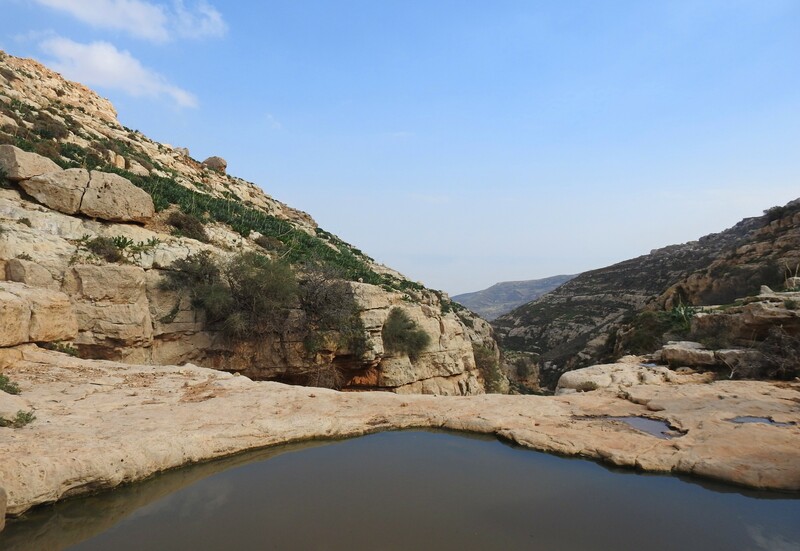 A half hour later we took a break, sitting down beside the freshwater spring of Ein Rash’ash. We broke for lunch and ate in peace, celebrating the glorious mountain view that sprawled out before us. 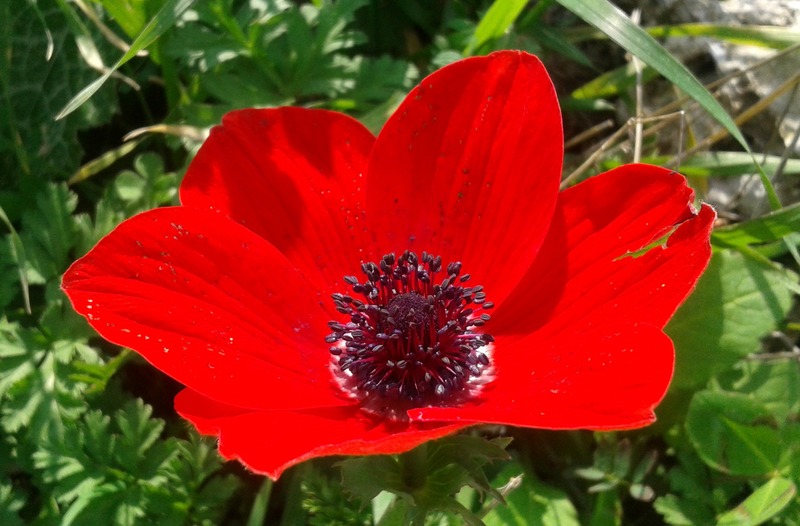 There were a handful of birds around us, including the ever-patrolling black kites, a few noisy Tristram’s starlings, a blue rock thrush or two and a lone Syrian woodpecker that perched relatively close-by. 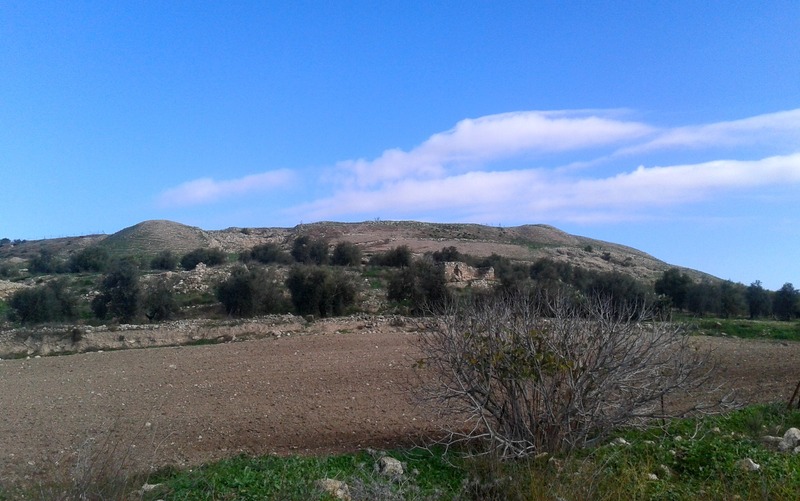 Suddenly Adam, who was periodically scanning the horizon with his 10×42 binoculars, cried out and pointed to one of the slopes in the direction of the Jordan River Valley. What followed next was a series of photographs taken at a great distance of a large bird of prey perched on the rocky slope hundreds of metres away. 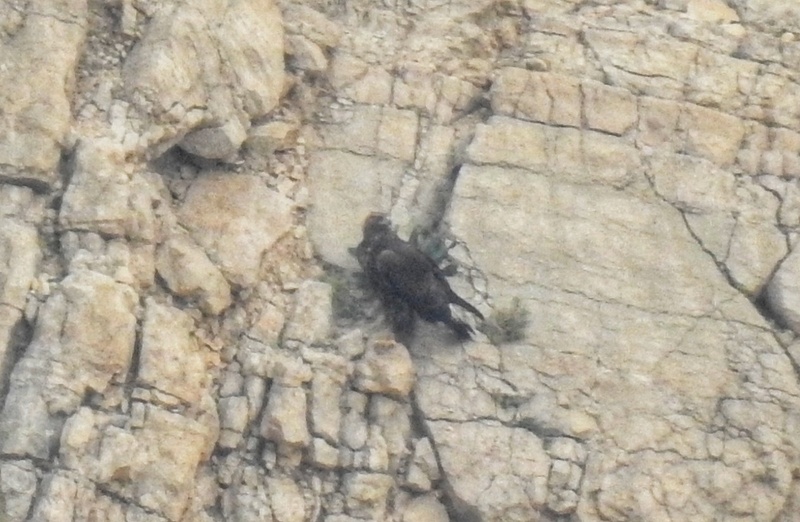 We had found a very first golden eagle, a relatively rare bird in Israel, and there was much rejoicing. It was nearly the end of 2018 and definitely a most welcome sighting to finish off the year. In 2017, I had spotted a white-tailed eagle in the Hula Valley mid-December, so now I just wonder what next big eagle I’ll see in December on 2019. 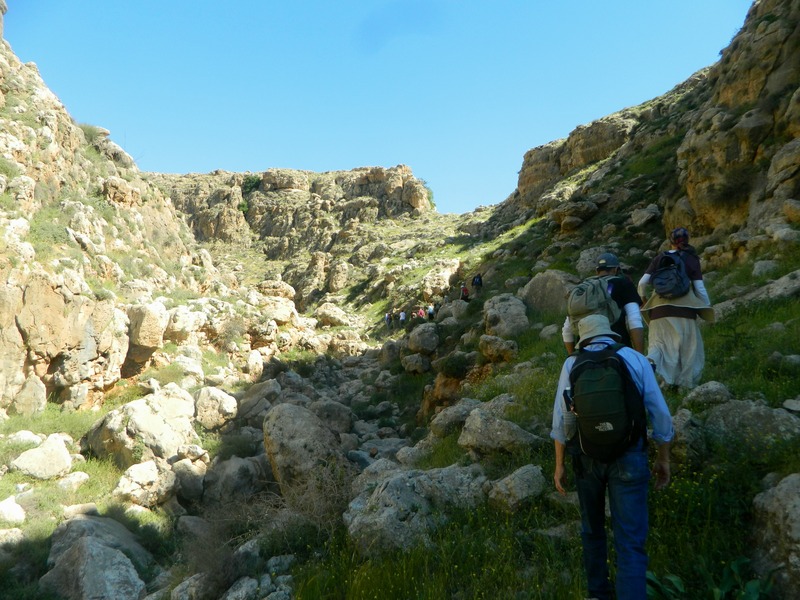 After our lunch break we got back up and continued hiking along the southern slope, learning about the geology and geomorphology of the region as we got closer and closer to the Jordan River Valley. Eventually reaching a ridge, we hiked like kings, the vast land stretched out around us nearly devoid of human presence. After the ridge came the slope and we found ourselves entering the valley at Einot Pazael, where springs and a slow, gurgling brook can be enjoyed. When we gathered around the brook, tea was prepared and snacks passed around, for the sun was setting over the mountainous region we’d just hiked and we were all a tad cold and in need of nourishment. A great grey shrike came by to watch us, calling noisily from a nearby jujube tree, as we wolfed down pretzels, crackers and cookies. 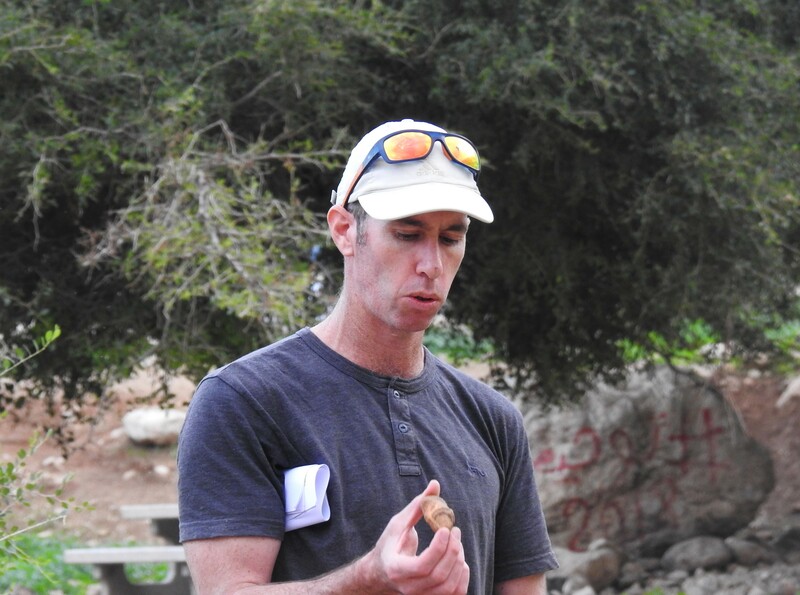 When we were done there it was just a short walk to the bus and then the long drive back to Bar Ilan University, bringing the first day of the field class to an end. 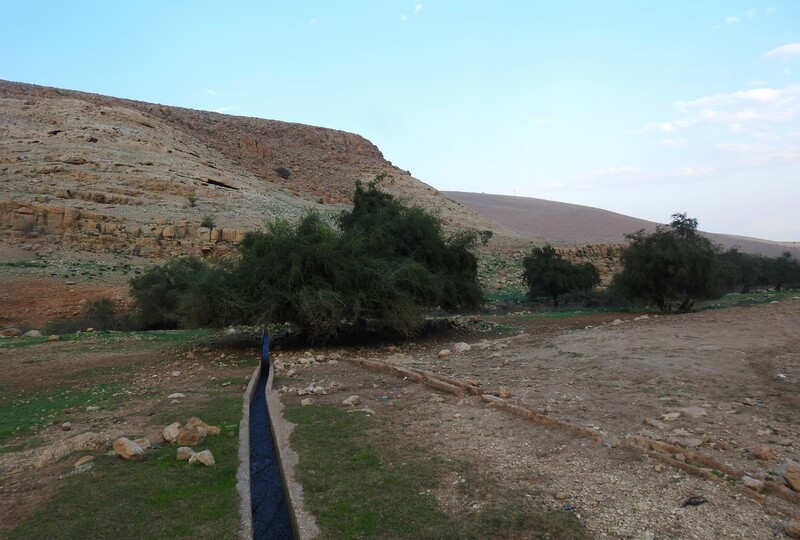 The second day, scheduled for mid-January, took place in Wadi Dalia and Sartaba and shall be written about posthaste (or something like that). 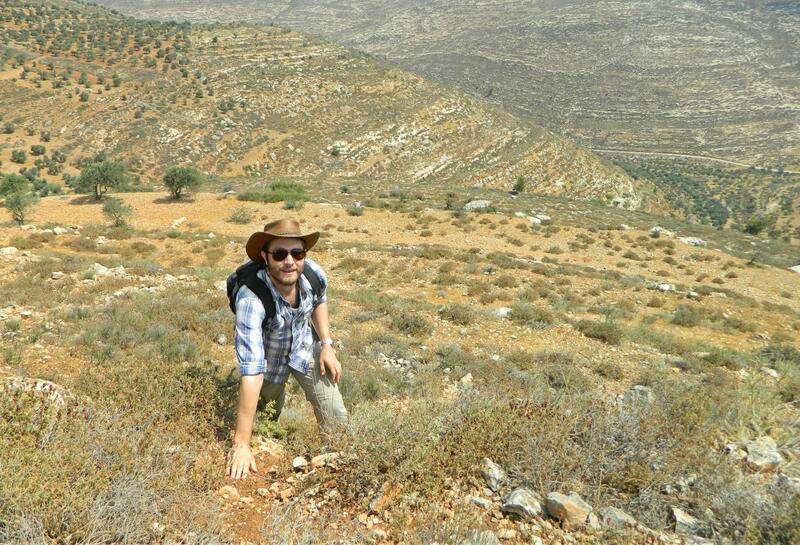 A few weeks ago I partook in a little “excitement” in the Shomron (Samarian) town of Pedu’el, not too far from Ariel. 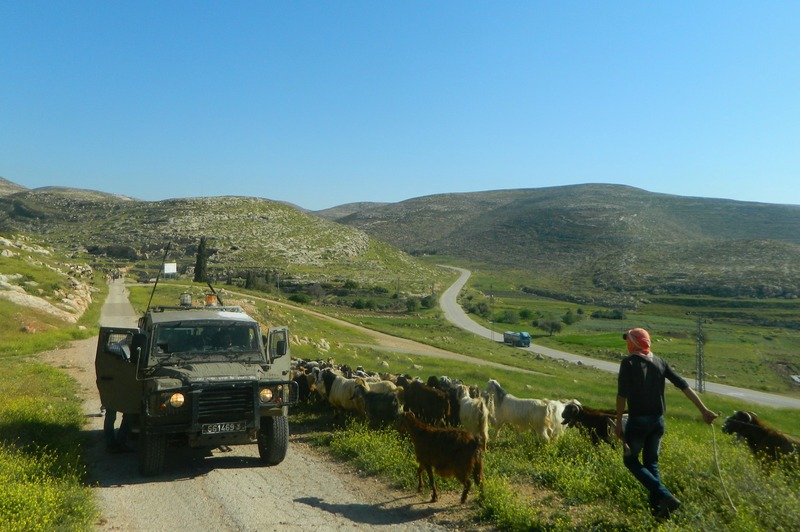 There was a Palestinian shepherd who was creating disturbances near the security fence that encloses Pedu’el and we, the army, were called in to redirect the wayward man. We disembarked near Pedu’el yeshiva and I couldn’t help but notice signs for an archaeological site called “Deir Qal’a”. 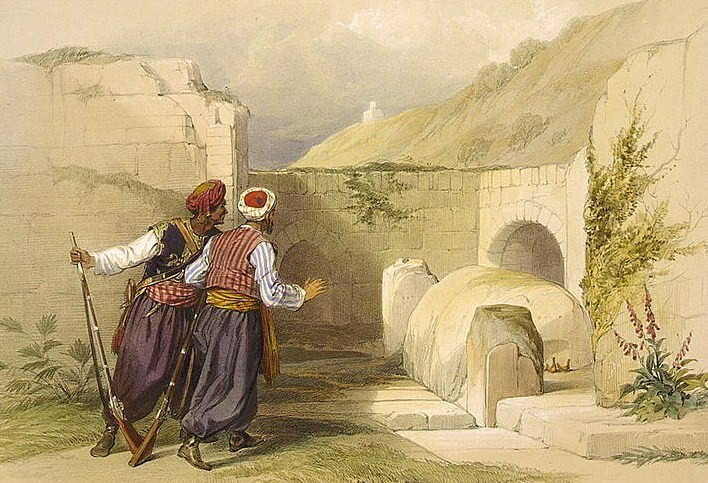 While the other soldiers began their descent into the valley in search for the shepherd, I sought after the ruins. 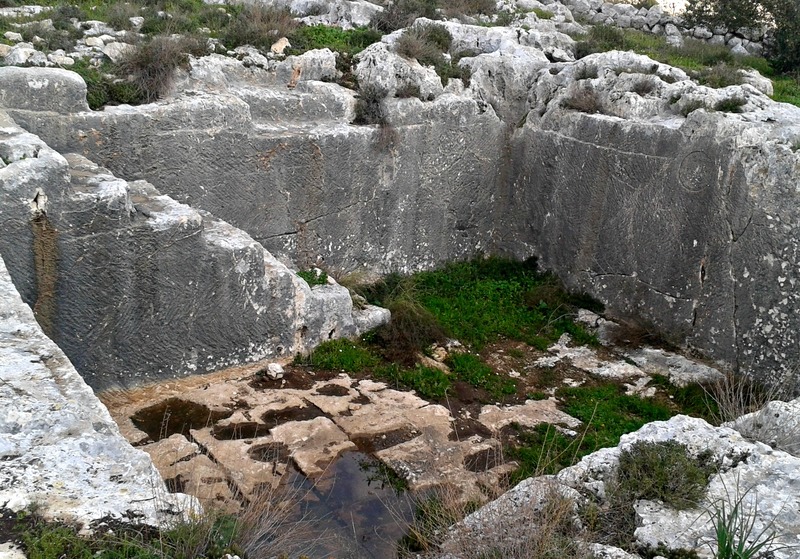 Scampering over the rough rocks that cover the landscape, I first came upon what appears to be a vat for wine with a mosaic floor, very much like the one I saw at the Crusader castle of Cafarlet. 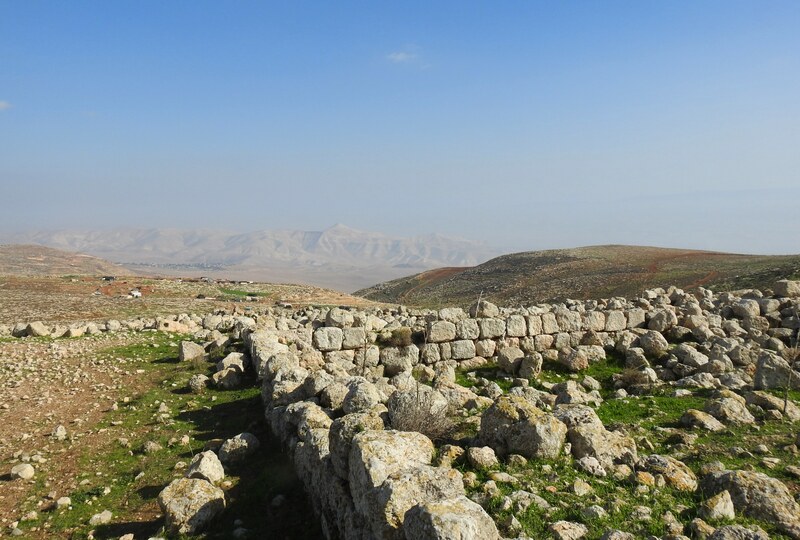 Now, these ruins are obscure and there are no signs explaining where or what anything is – even researching Deir Qal’a online is proving a little difficult. From what I’ve gathered is that the site was first a Roman fortress, then a Byzantine fortified farm and then a Christian monastery. 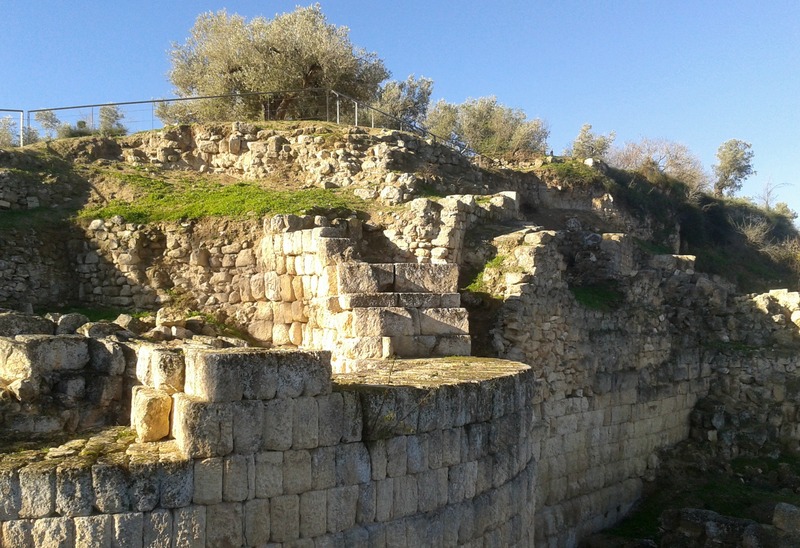 Given its great vantage points, including a clear view of the shoreline some 26 kilometres (16 miles) away, the Romans would have built the fortress to guard the ancient road from Tel Afek (Antipatris) to Sebastia in the heart of the Shomron. 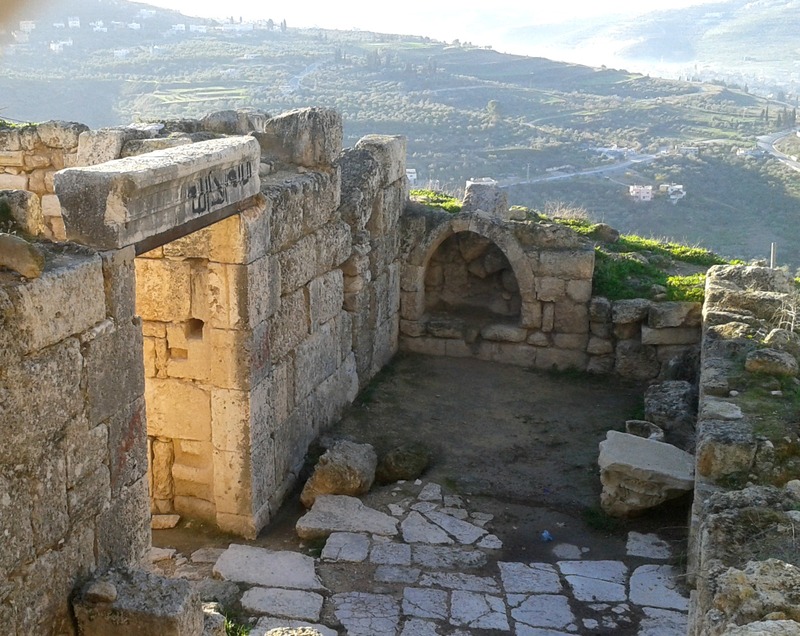 A couple hundred years later, the Christians built a string of fortified monasteries along the northern border of the Christian part of the Shomron, as a defending line against the Samaritans who would often break out in violent revolts against the Byzantine Empire. 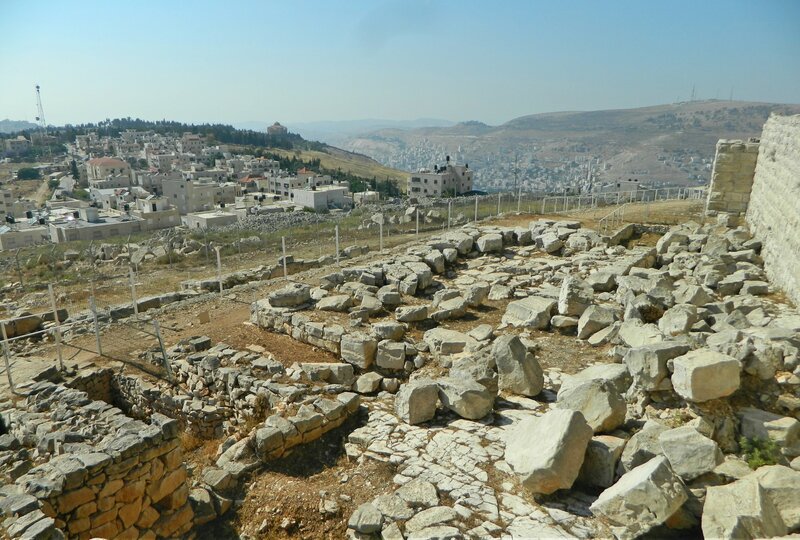 The Samaritans are still around today, still based out of their “capital” on Mount Gerezim overlooking Shechem (Nablus), but they no longer participate in violent revolts. Monasteries neighbouring Deir Qal’a are Deir El-Mir to the west and Deir Simaan to the northeast – with quite similar ruins, although I have yet to explore them. Getting back to my exploration of Deir Qal’a, it wasn’t long before I reached the first walls of finely cut ashlars jutting out into the air. Unfortunately, as there is no guide or comprehensive description of the ruins, I can’t really describe the series of rooms that I then saw as I drew closer. While researching this site I came across a reference to a monograph written by the late Professor Yizhar Hirschfeld titled “Deir Qala and monasteries of Western Samaria”, however the only copy I could find is in the Hebrew University’s library in Jerusalem – not too readily available, although I’m sure I could have gleaned some useful information from it. 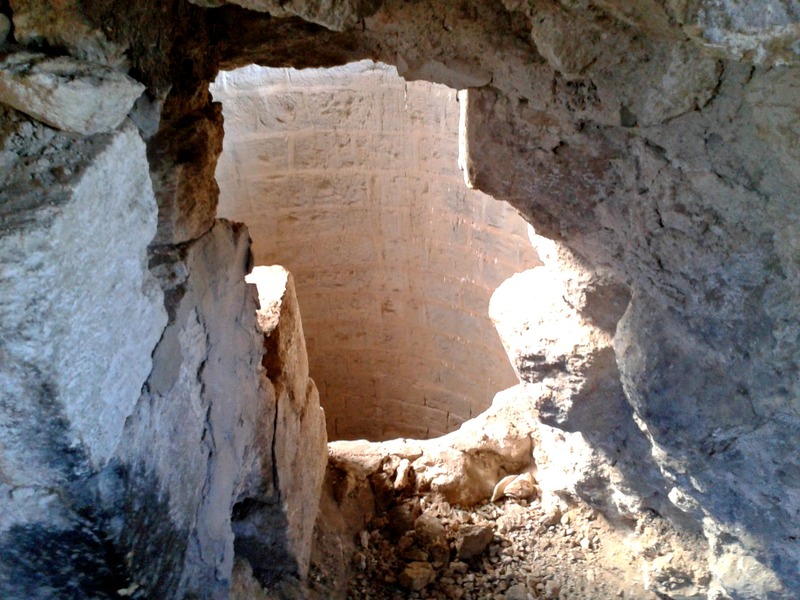 Being as that I was detouring from “operational duty” I couldn’t linger too long and missed noticing that there are tunnels connecting several of the rooms in the ruins complex. What I didn’t miss were the numerous etched Maltese Crosses (as used by the Hospitaller Knights of the Crusades) and the incomplete floor mosaics – in fact, a fully restored mosaic from Deir Qal’a is on display at the Good Samaritan Museum between Jerusalem and Jericho, not far from Nabi Musa. 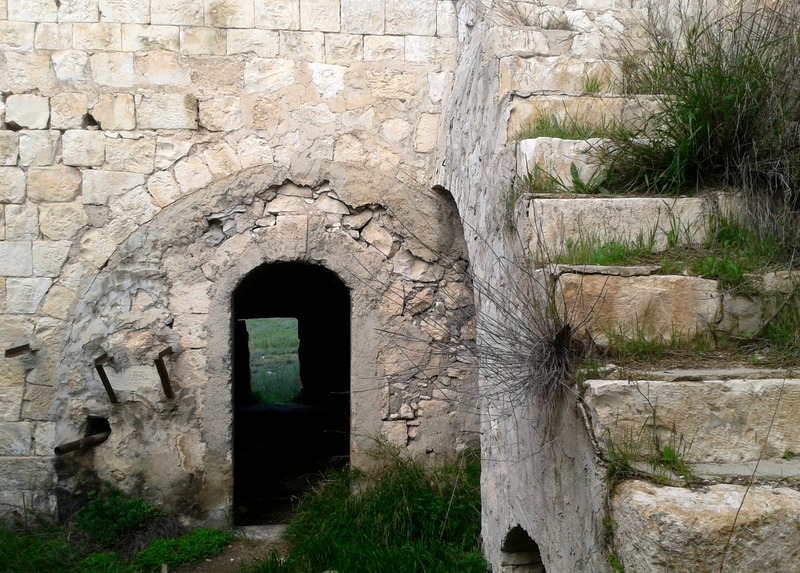 I might have just seen an nondescript scattering of stone walls of varying heights and materials but Deir Qal’a contains stone terraces, rooms, cisterns, an olive press and winepress, underground tunnel, a church with an underground cave/crypt and an apse. 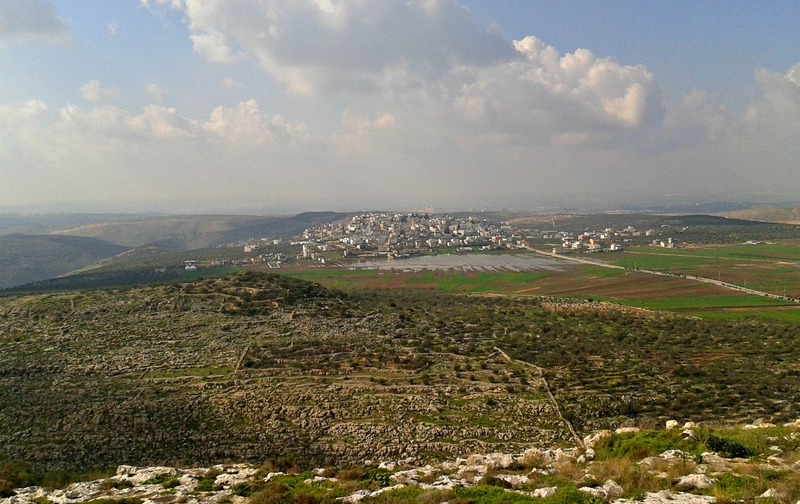 To the south there are the rolling hills of the Shomron with ruins abound, including the remains of Binat-Bar, Zereda, Balata and other historically rich sites, as well as Nachal Shiloh snaking its way across the land. Someone very thoughtful had installed a swinging bench overlooking Deir Qal’a and Deir Balut and so I found myself there, rocking back and forth, enjoying every moment. At last the soldiers came back from escorting the shepherd away from the fence and we drove back to our outpost, leaving me with the need to come back and explore the other ruins another day. I have uploaded footage from this experience, filmed by the lieutenant in the passenger seat, onto YouTube. It’s no high-definition GoPro video but here it is: http://youtu.be/BFvL0v4XDtE (at 00:09 you can hear the explosion of the TNT charge that was thrown at my right rear tire area). 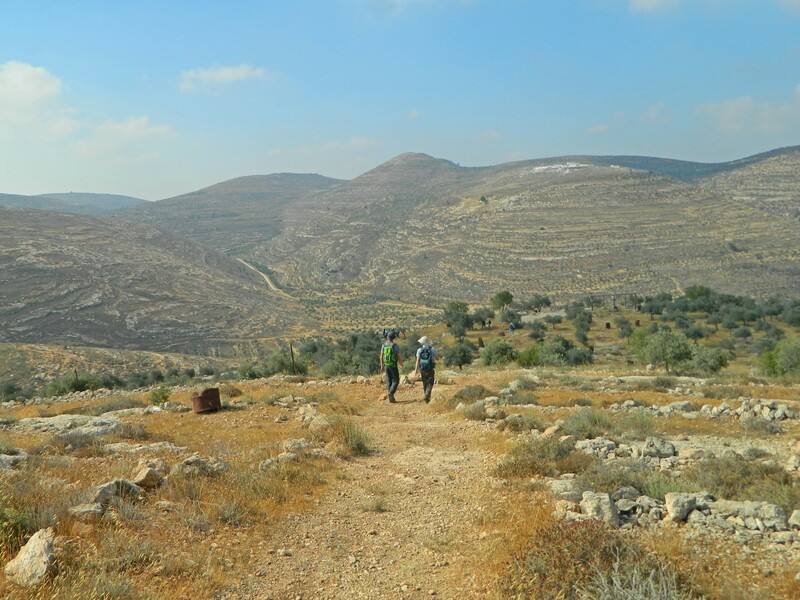 After the excitement in the village we continued north on Road 60 until we came to the turn-off for Tel Dotan and Joseph’s Pit, just past the village of Araba. 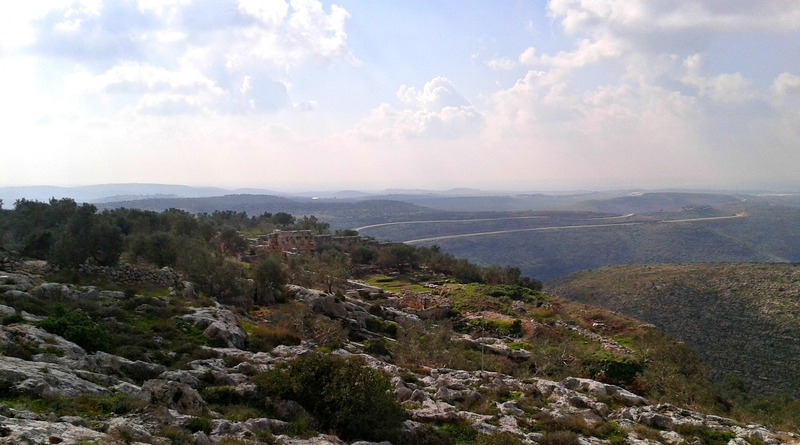 Driving on the incredibly bumpy dirt road, we approached the hill that is Tel Dotan. Unfortunately, we were slightly pressed for time and weren’t able to fully visit the site. 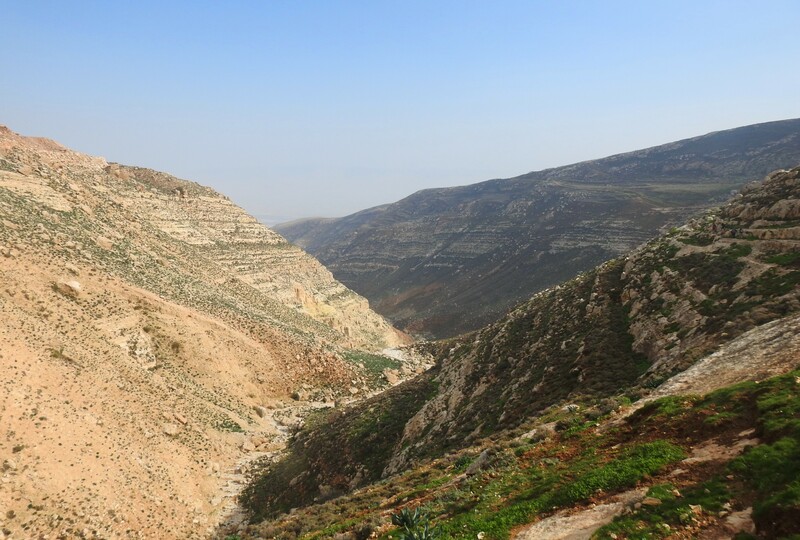 So we started with Joseph’s Pit – or shall I say, one of three possible pits – directly beside the dirt road. 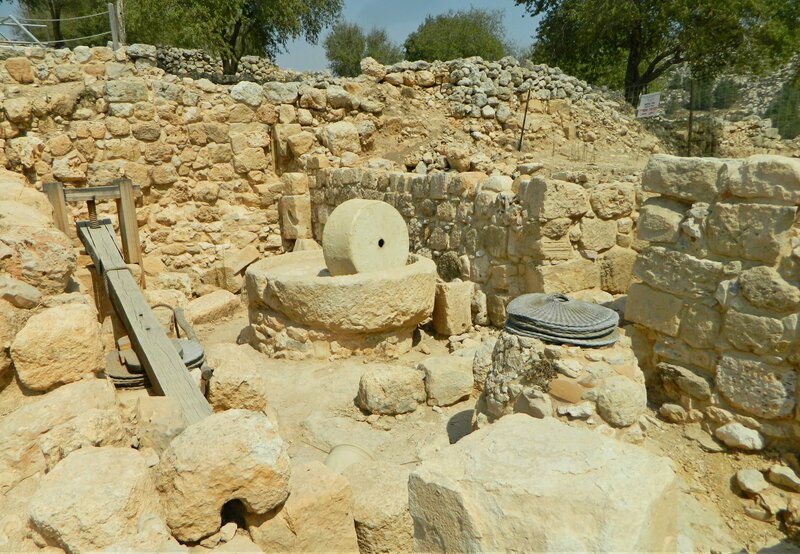 To review the Biblical story, Jacob and his family had moved to the Holy Land and continued in their shepherding lifestyle. 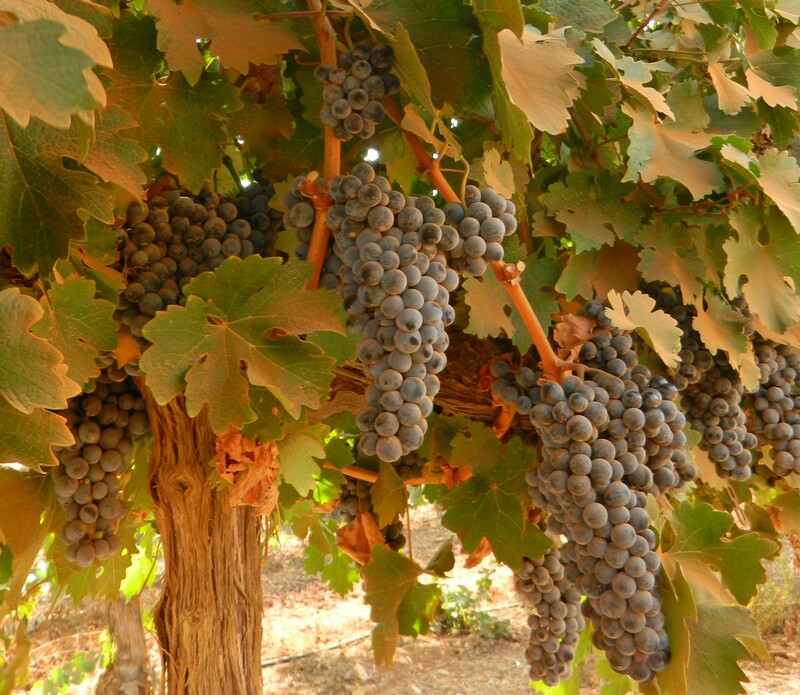 Joseph was sent by Jacob to locate his brothers who had gone out grazing from Hevron to Shechem; he found them at Dotan some twenty kilometres north of Shechem. It was there that they cast him into a pit and then sold him to Ishmaelite traders who took Joseph down to Egypt where he eventually rose in power to become a viceroy. 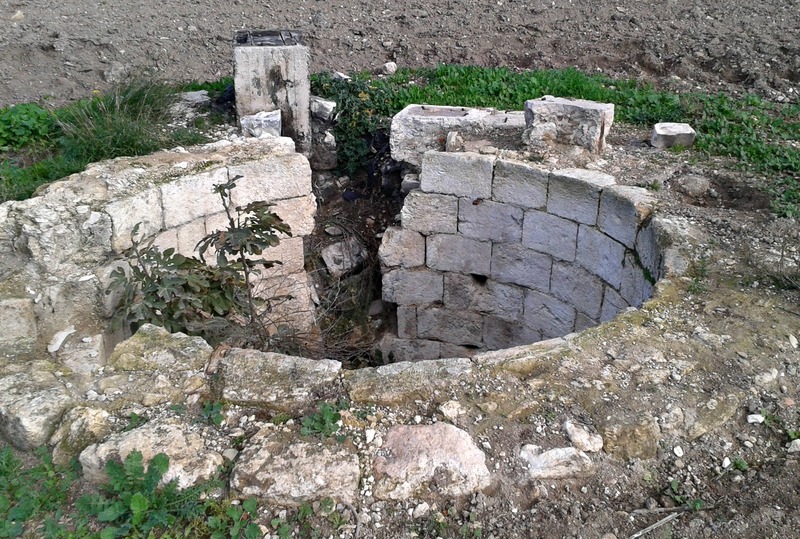 Now, I have heard but cannot verify that there were two pits in the story and that one was filled with snakes and scorpions – the pit that Joseph spent the night in. So here and now there are three pits to choose from, although it’s possible that these aren’t the pits in question at all. We had all gathered around these two pits and it was announced that we were waiting for the battalion commander to swing by with his command jeep to give a few words. Seizing this opportunity, as I’m not really involved in their command pyramid, I decided to go check out the third pit alone. 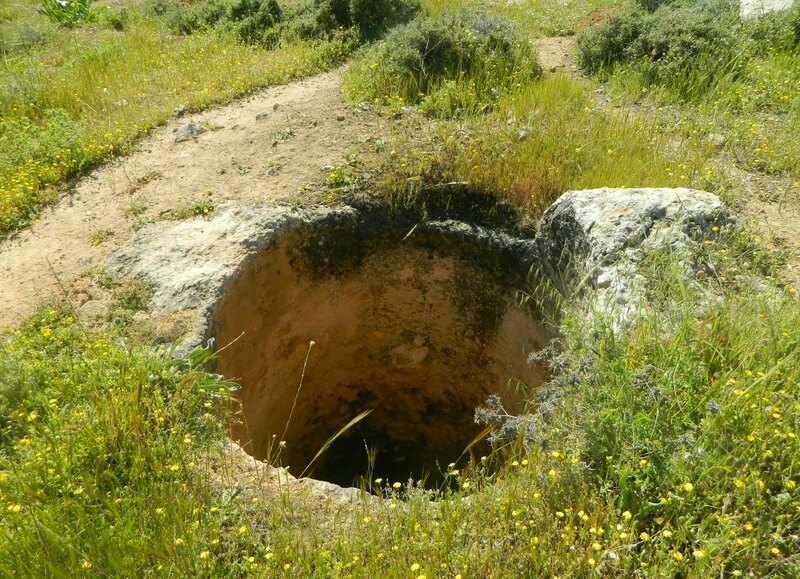 Located inside an old stone house of sorts, the third pit is a the furthest from the dirt road, not far from the base of the tel. I entered the old structure, seeing traditional vaulted rooms, arched doorways and the lone stone staircase built on strong arches. 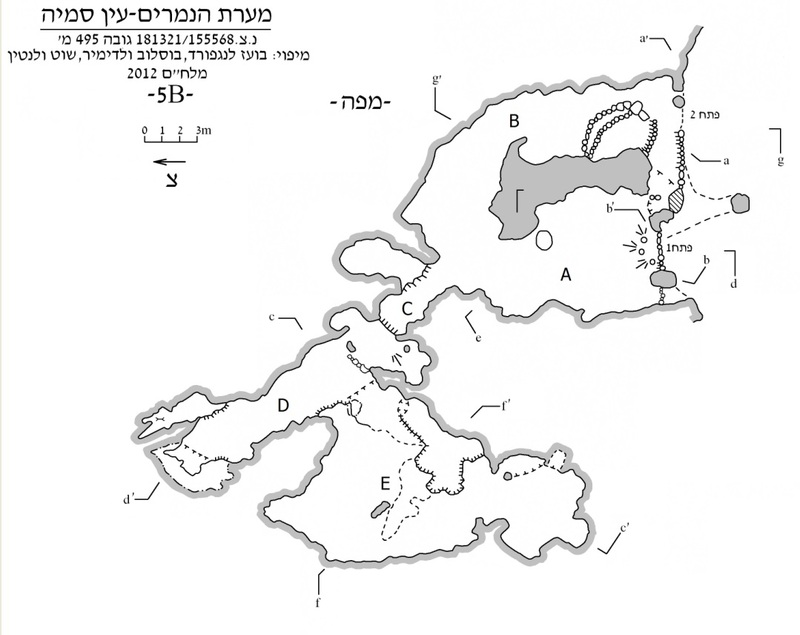 I wonder about the site’s history, but haven’t found anything online about it, especially because according to the Muslims (and agreed upon by the Crusaders), the site of Joseph’s Pit is in the Galilee next to Kibbutz Amiad just a few kilometres north of the Kinneret (Sea of Galilee). The Muslim version is known as Jubb Yussef and a small kahn was built at the site somewhere between the 1200’s and the 1500’s to host pilgrims and passing travelers. Inside the rooms, there were also more modern machinery – what looked like a pump of sorts; an assortment of pipes and a motor. I looked around for the pit, treading carefully, and then spotted light streaming in from a breach in the wall. 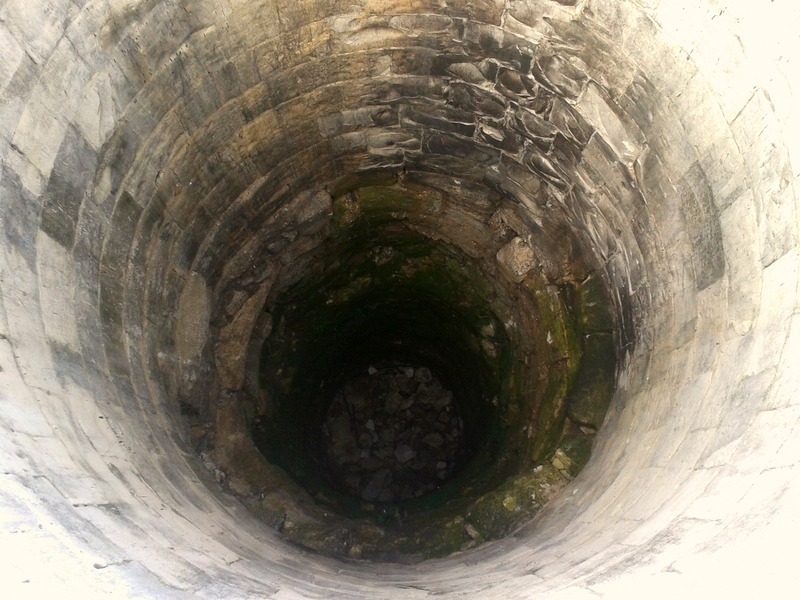 Peering into the light, I looked down to see the third pit. 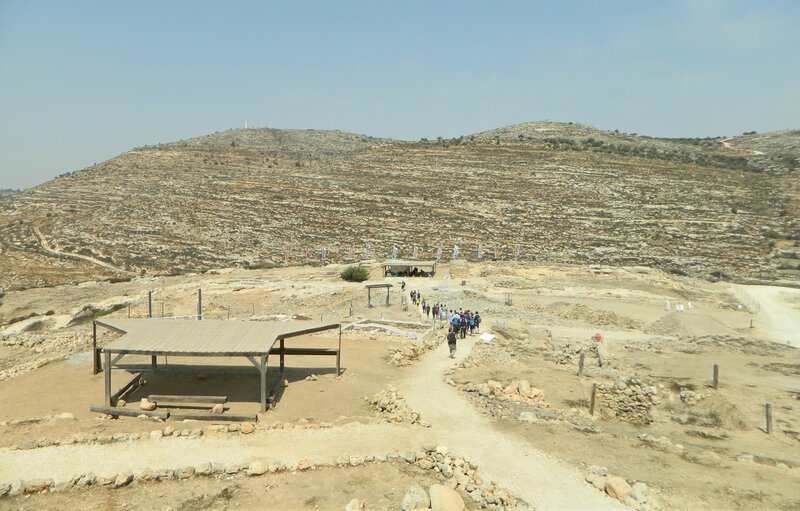 To recap, one of these pits are believed to have taken part in the famous Biblical story although it’s not certain to be any of them. After my look around I headed back to the group and we said goodbye to Jabo our tour guide as he got into the battalion commander’s jeep and headed out. 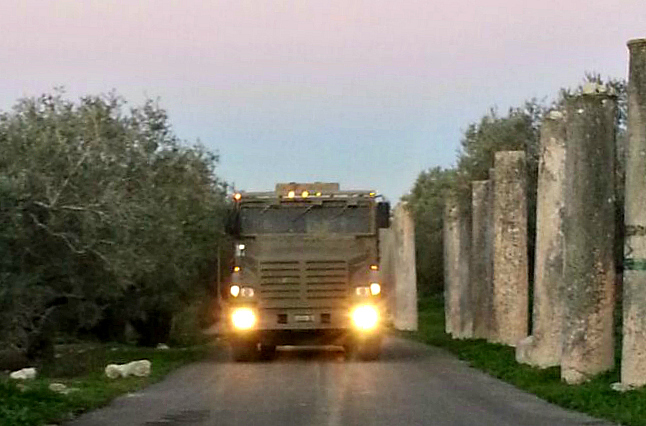 We boarded and departed from the site in our convoy formation, heading back to the outpost of Mevo Dotan – a Jewish town built and named after the ancient region of Dotan – for a continuation of the day’s events. 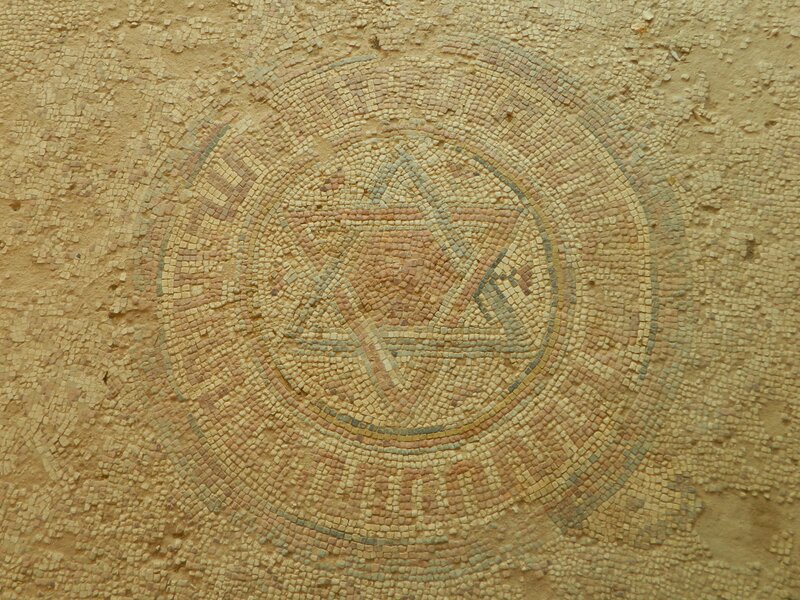 Hopefully one day I’ll have the opportunity to visit Tel Dotan, but as it is located in Palestinian controlled land, only time will tell. Two weeks ago I found myself in Netanya’s Central Bus Station and had a while to wait for my bus to Outpost 105, bordering Tul Karm, where I was to drive a Safaron. Not familiar with Netanya in the slightest, I glanced at a map and saw that some archaeological ruins were in walking distance. Trudging along, with my heavy backpack and gun, I walked over to what was labeled as “Umm Khalid”, passing an ancient sycamore tree (estimated to be around 1,000 years old). 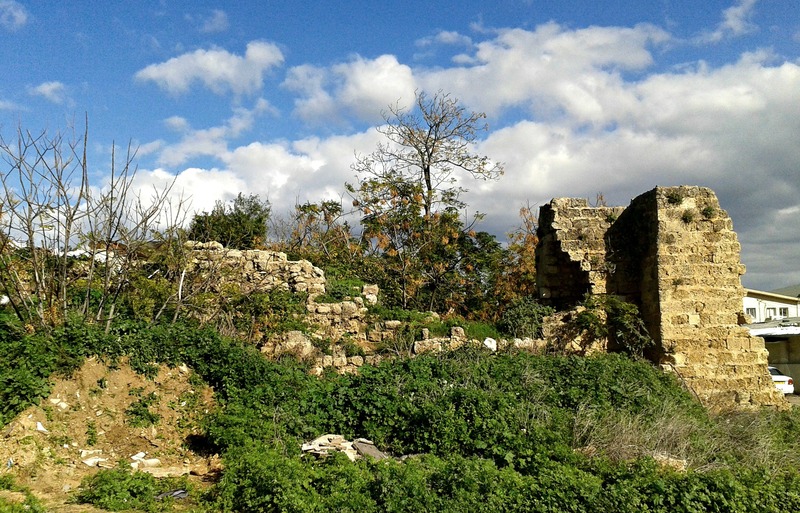 The ruins I came upon is the Crusader Castle of Roger the Lombard, located on top of a little hill looking out over the surrounding cityscape. 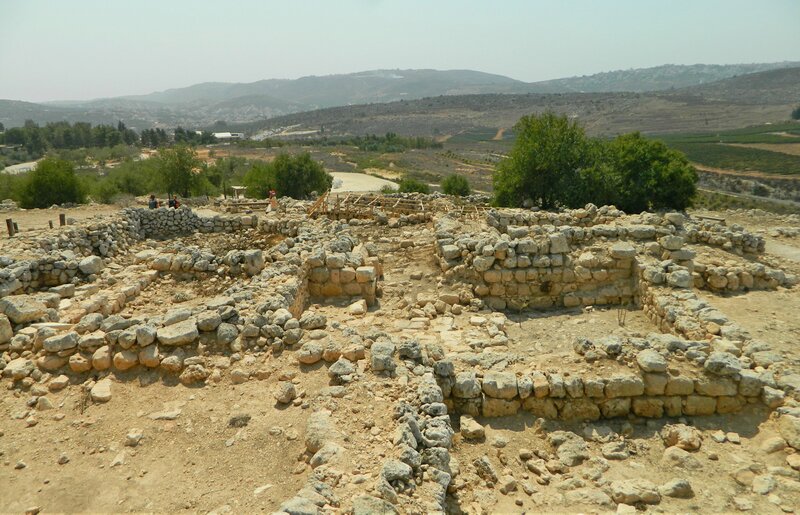 Also known as the city of Shomron, or Samaria, the ruins are from an array of eras starting with the Kingdom of Israel some 2,900 years ago. 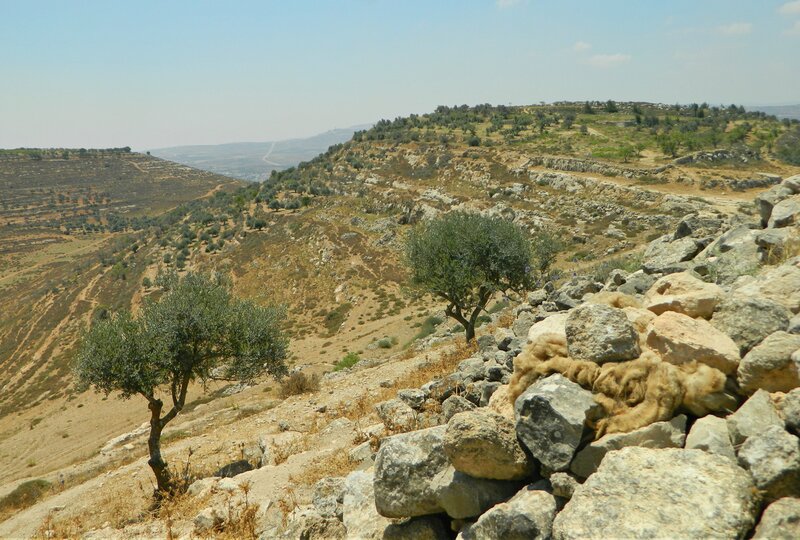 Located just a few miles away from Shechem (Nablus), King Omri moved his capital from Tirzah (in the mountains of the Jordan River Valley) to a safer area inland, property which he purchased from a man named Shemer (the origins of the name Shomron). 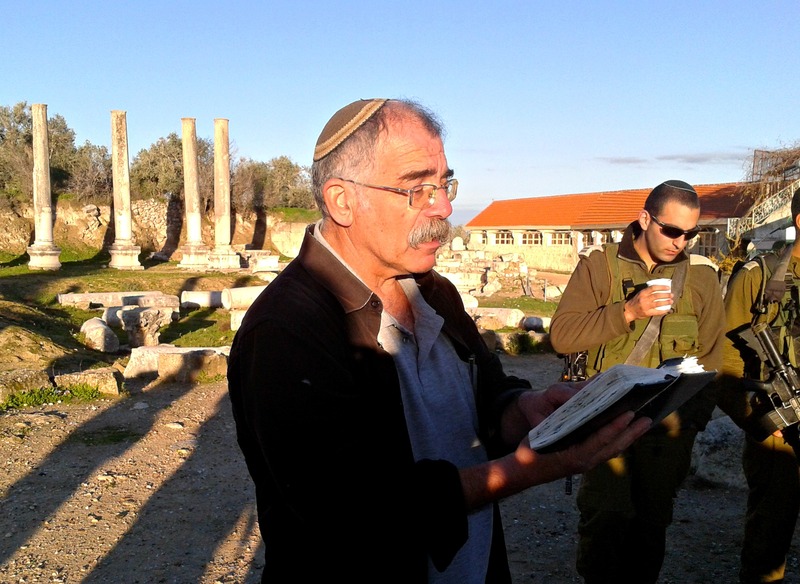 When we parked at the graveled expanse beside the Roman Forum and Basilica, we were introduced to our mustachioed tour guide Jabo and then we began morning prayers. After breakfast we all gathered around Jabo as he gave us an introduction of the site and opened up a Bible to read us passages about ancient Shomron. 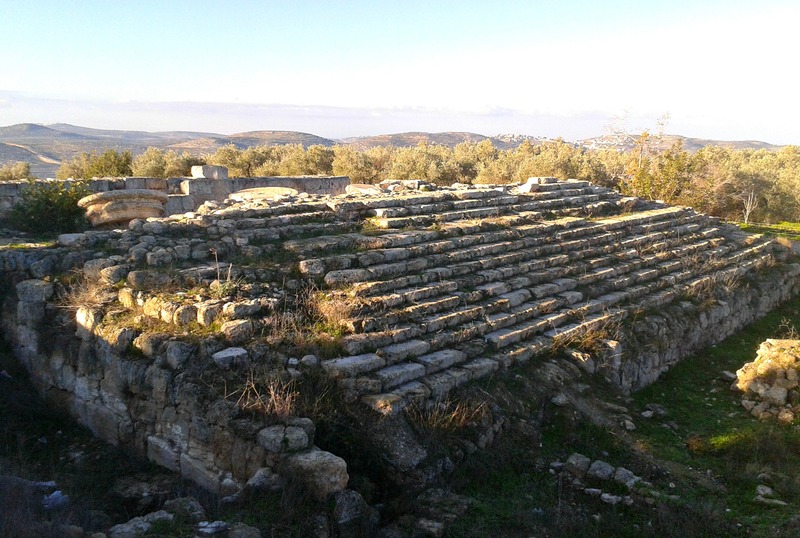 We started with the Roman ruins directly before our eyes, noting the Forum, the Basilica and the Tribunal where court cases were held. 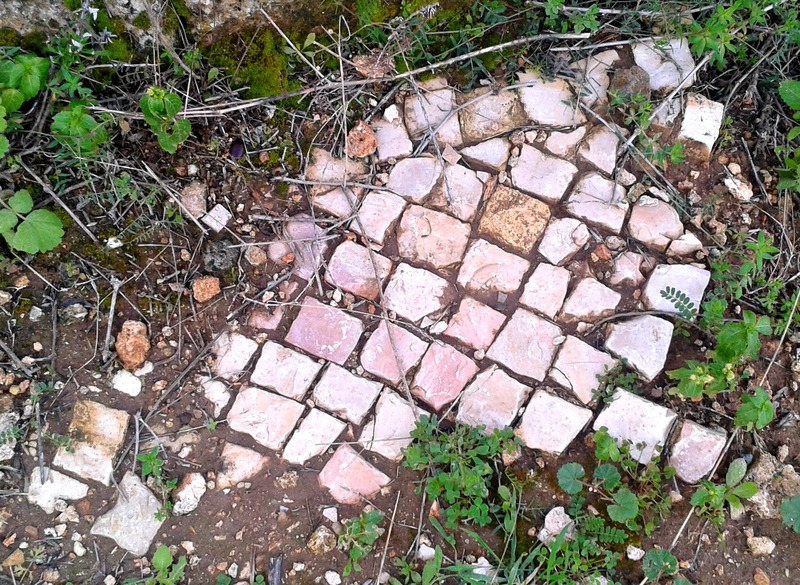 Unfortunately, although Sebastia is an official national park, the land is mostly controlled by the Palestinians and thus maintenance is at a minimum – resulting in a ridiculous amount of litter including countless Alfa Cola bottles. 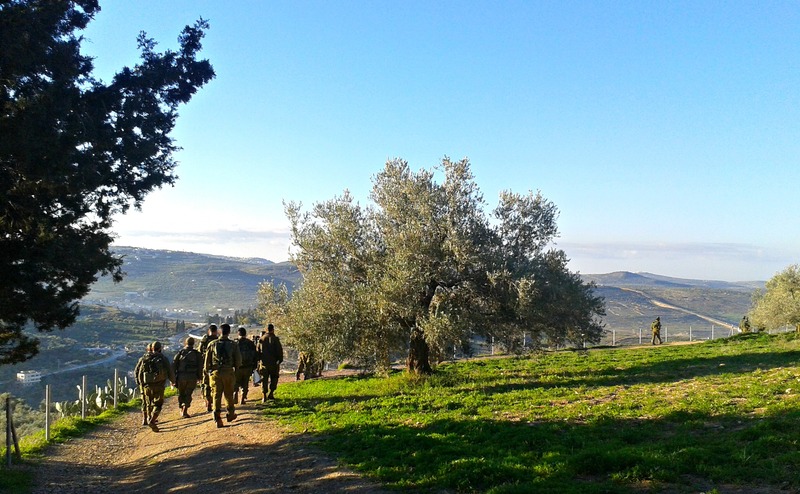 Additionally, Israeli (and Jewish) visitors can only safely visit by making arrangements which are coordinated with the army, who accompany the scheduled tour. Thankfully, we are the army so we had no issues with scheduling visits, we just drove up. 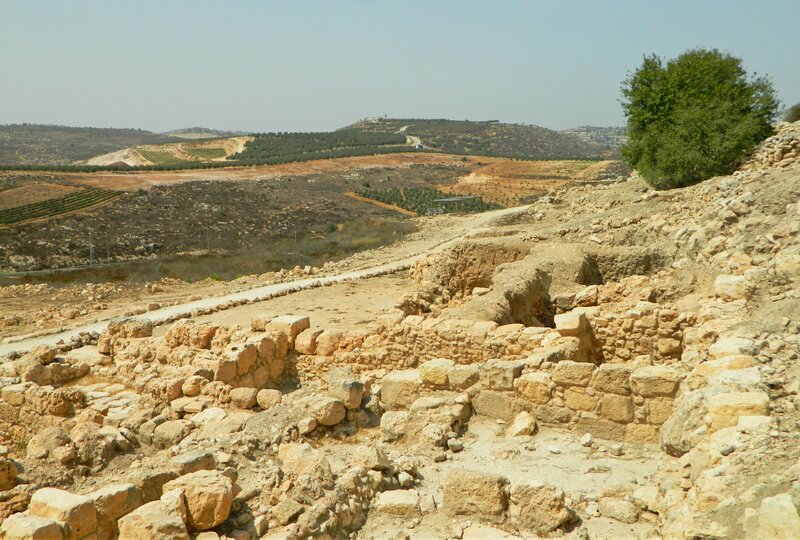 To the southern end of the pillared area Jabo pointed out the excavated wall and gate from the original Kingdom of Israel. Stopping abruptly, Jabo called out greeting to an older Arab man opening up his shop. 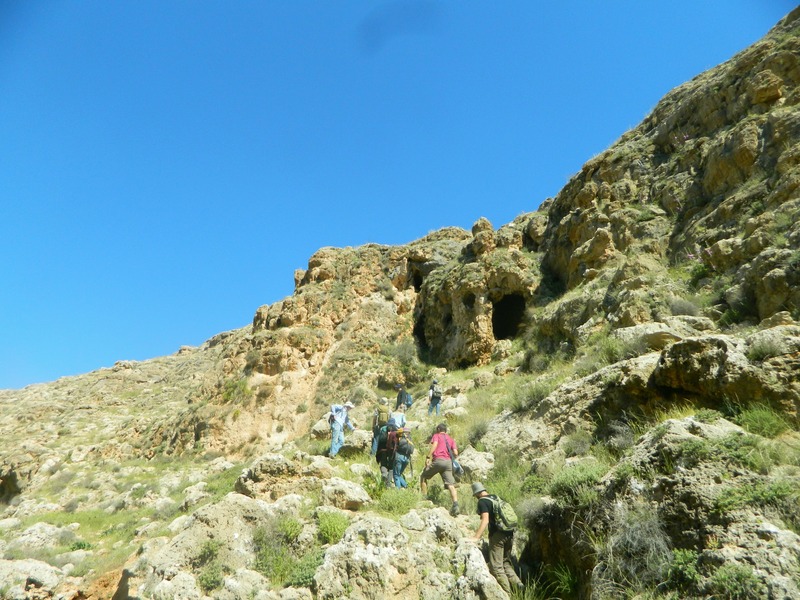 Their Arabic exchange was short and we continued on, passing over partially uncovered length of metal which Jabo explained was part of the old Hedjaz Railway (in fact, the local station is just down the hill). 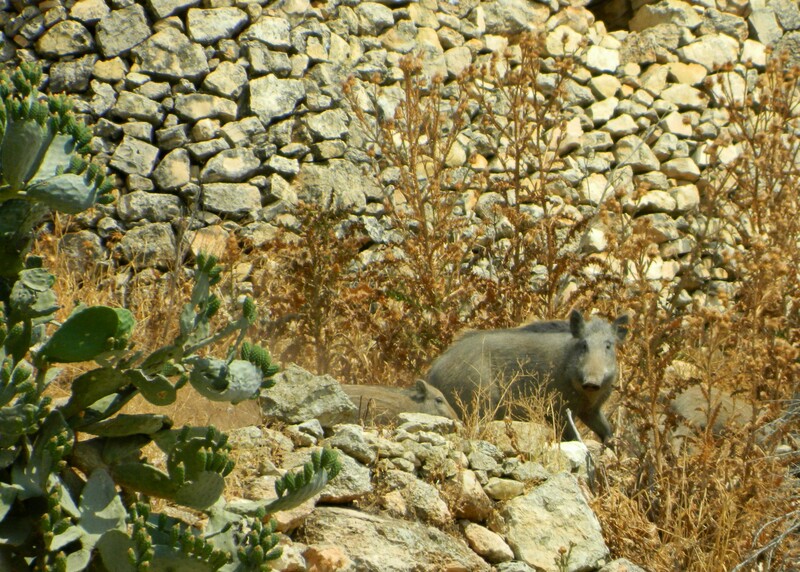 We walked along a bend in the short trail, taking in the views of the Samarian countryside. We regrouped at the Byzantine Church built some 1,600 years ago and then restored in the Crusader era and dedicated to John the Baptist following his beheading. In the main room there is an underground crypt where relics were once stored. 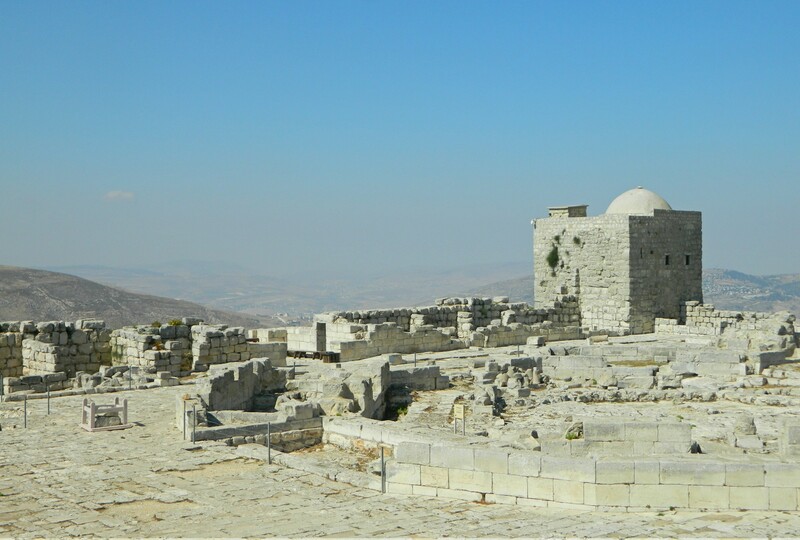 A much larger church built by the Crusaders at John the Baptist’s grave, located in the bordering village of Sebaste, was eventually partially destroyed and turned into a mosque. 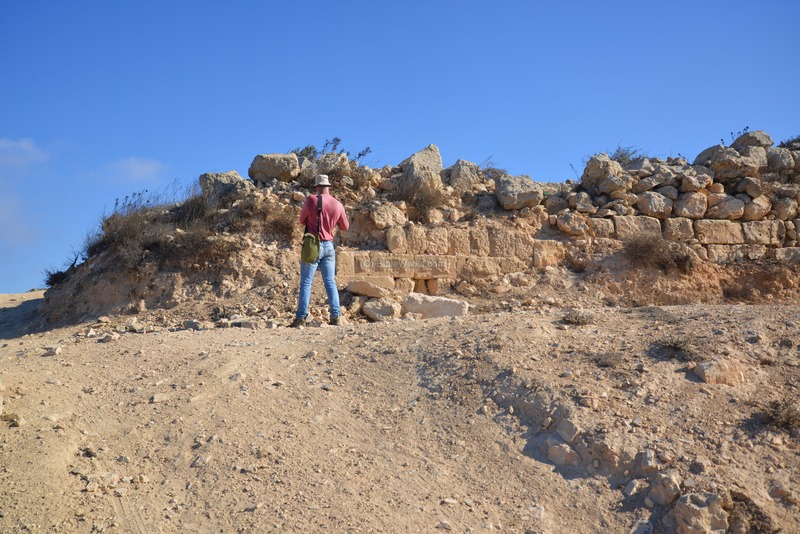 Passing three semi-recent Christian graves, we reached the excavated ruins of the ancient palaces of the Israelite Kings Omri and Ahab. 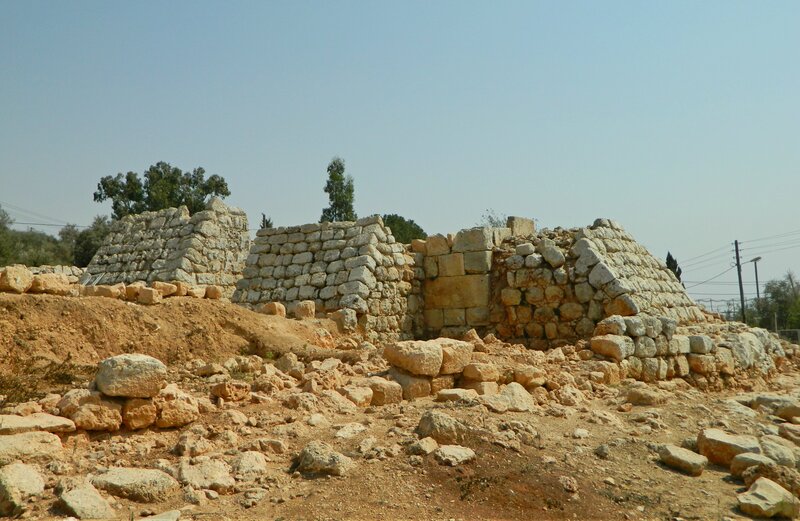 Seeing the mass of uncovered stone walls reminded me at once of Tel Dan, with its rich Canaanite and Israelite Kingdom history. 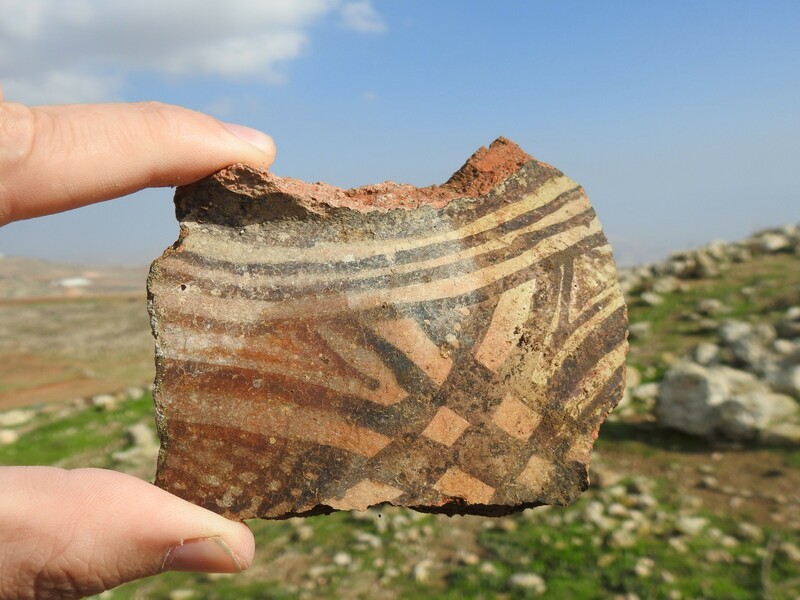 Archaeologists found scores of ceramic pieces with ancient Hebrew writing on them, Phoenician ivory and other important artefacts which help tell the tale of the palace that once was. We climbed the mound in the above picture’s background and looked down on the Temple of Augustus built by Herod in honour of the Roman Emperor Augustus. The Emperor, born Gaius Octavius, was the heir to Julius Caesar and was referred to as Augustus/Sebastos (Latin/Greek for the Roman imperial title meaning “majestic”, respectively). 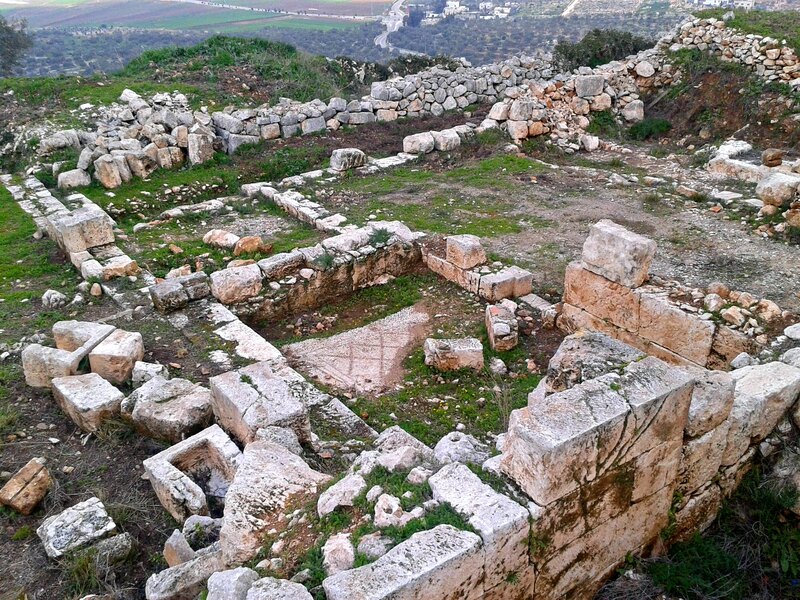 So, during the Roman era the name “Shomron” was changed to “Sebastia” in honour of the Roman Emperor. 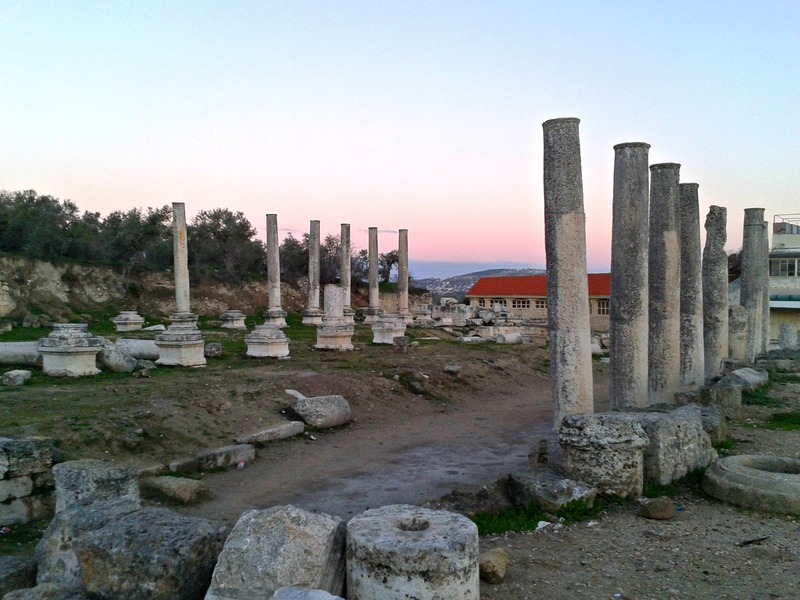 The temple was a grand building with a huge staircase and immense columns and statues, but it wasn’t enough so Herod built another temple at Banias and another at Caesarea. Atop the mound we scoured the horizons as Jabo pointed out innumerable interesting features and sites. One that struck me as fascinating was the placement of the surrounding Arab villages. They are all at the same altitude, roughly, having been built partially up the hill. Jabo explained that this was due to the underground water tables and their placement, something I didn’t fully understand. 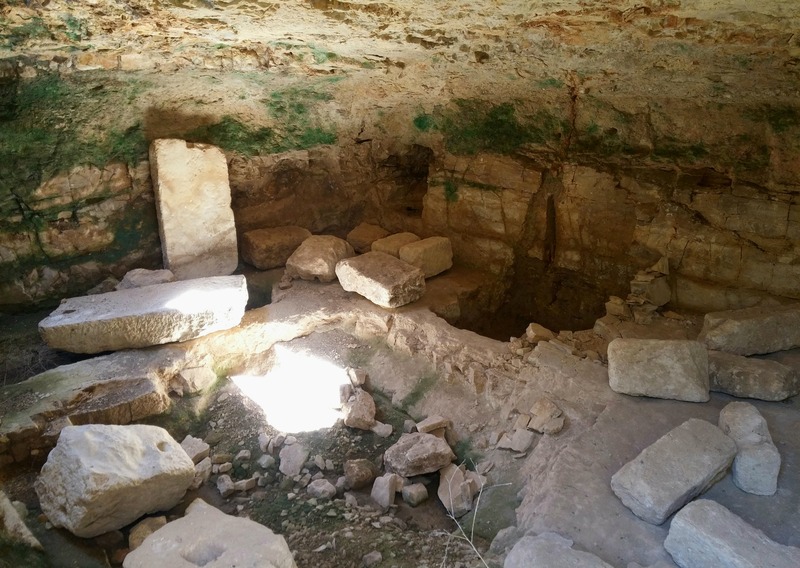 However, just southeast of Sebastia there is a little village called al-Nakura which bears a strange similarity to Israel’s Rosh HaNikra with its soft white rock and grottos. 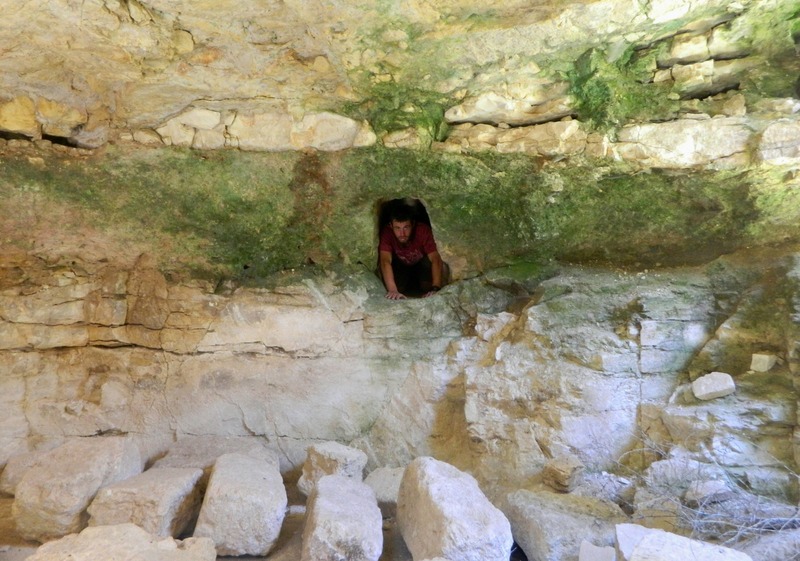 This al-Nakura is home to an 85-metre (280-foot) deep tunnel which was dug by Herod to provide water for Sebastia, as the city had no fresh water source of its own. 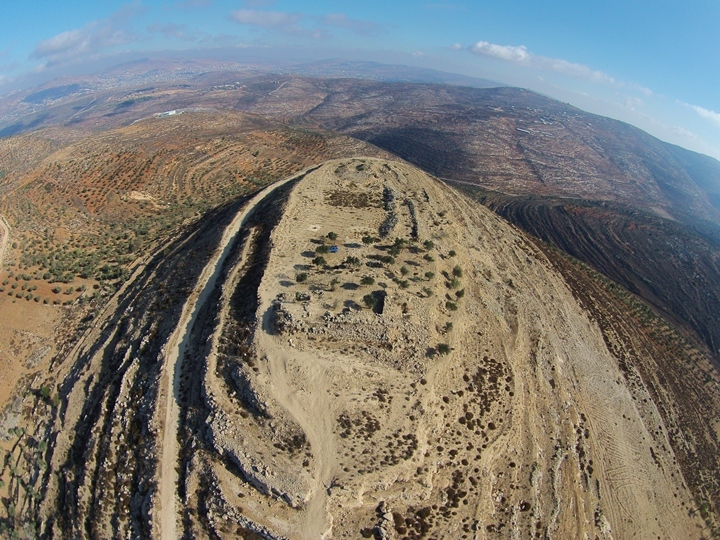 Also, there is a house visible on a hill to the east which was built by a Crusader named Stephan. Fascinating stuff, I say! 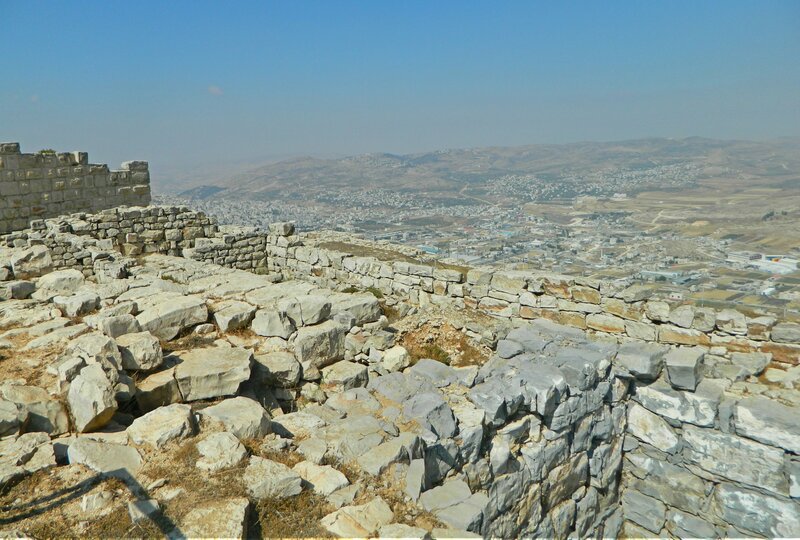 Continuing on, we came across the mess of Israelite fortress walls and a Hellenistic tower, built in Macedonian fashion. 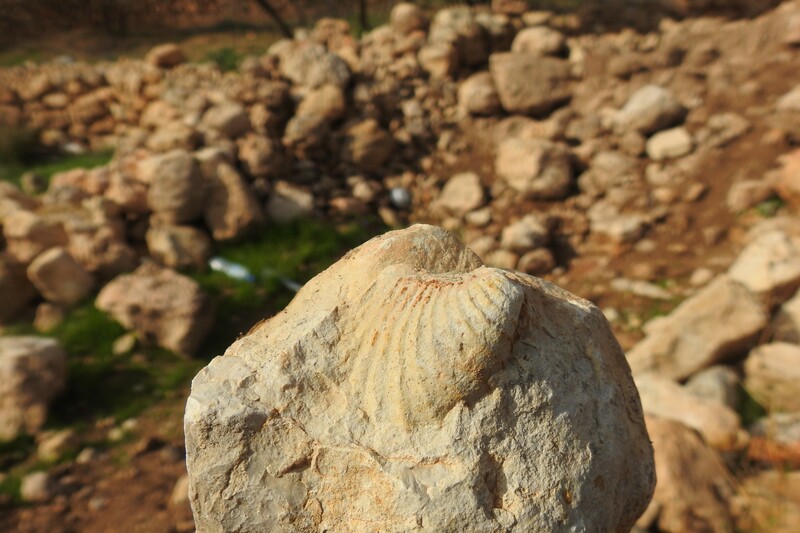 The following two places are found in the heart of the Shomron (also known as Samaria) and I had the pleasure of visiting both on the same day. 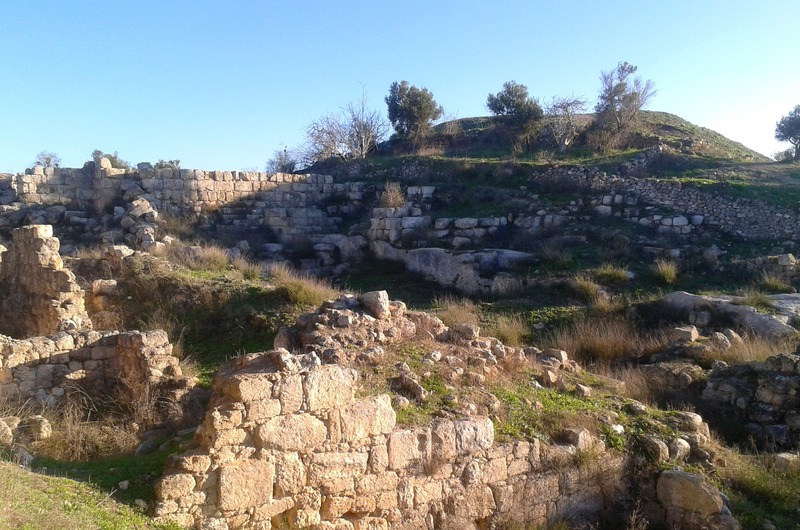 Due to the fact that I often do the night shift for the Safaron driving, I took a lazy Wednesday afternoon to visit nearby archaeological ruins in the town of Yakir. 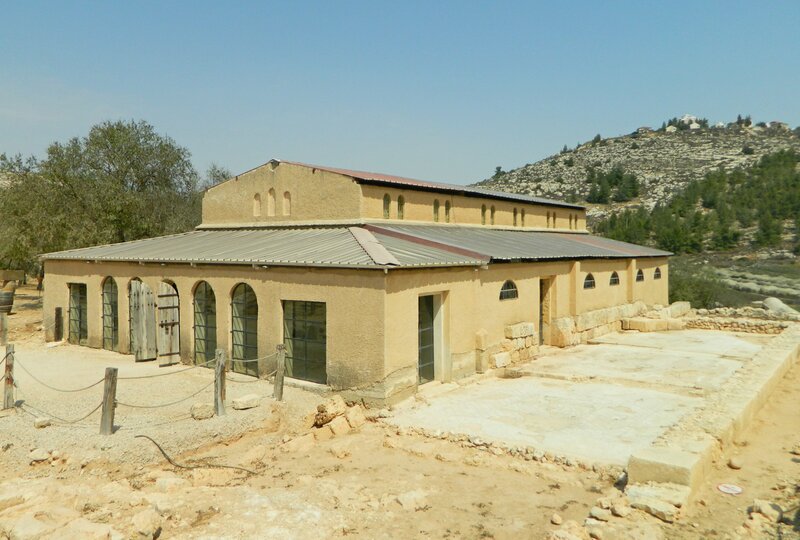 The military outpost Yakir, where I usually serve, is just a few minutes walk from my destination, Mitzpe Oded. 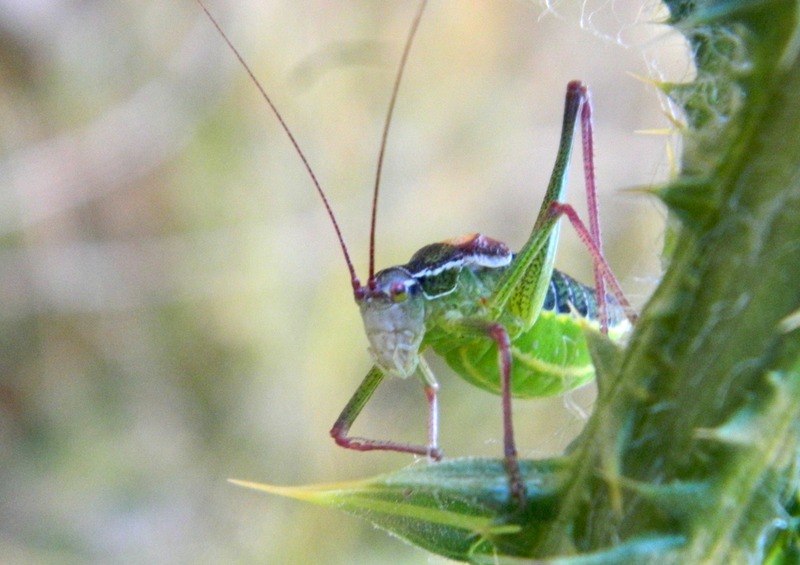 Mitzpe Oded was founded as an outlook in memory of Oded Fink who died of illness at age 30, a man with an appreciation for the land of Israel, its beauty and heritage. 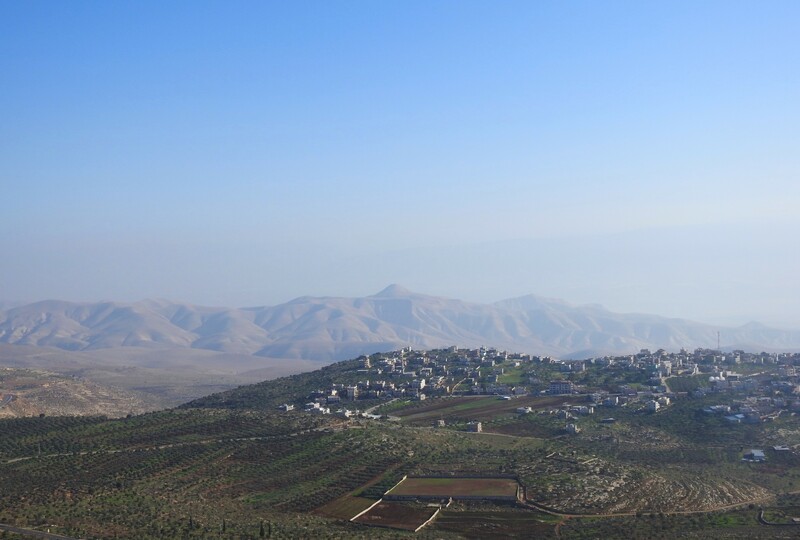 The outlook provides a view of the towns of Karnei Shomron, Immanuel and Yitzhar as well as the famous Biblical twin peaks of Mount Gerezim and Mount Ebal in the far distance and Nachal Kana running directly below. 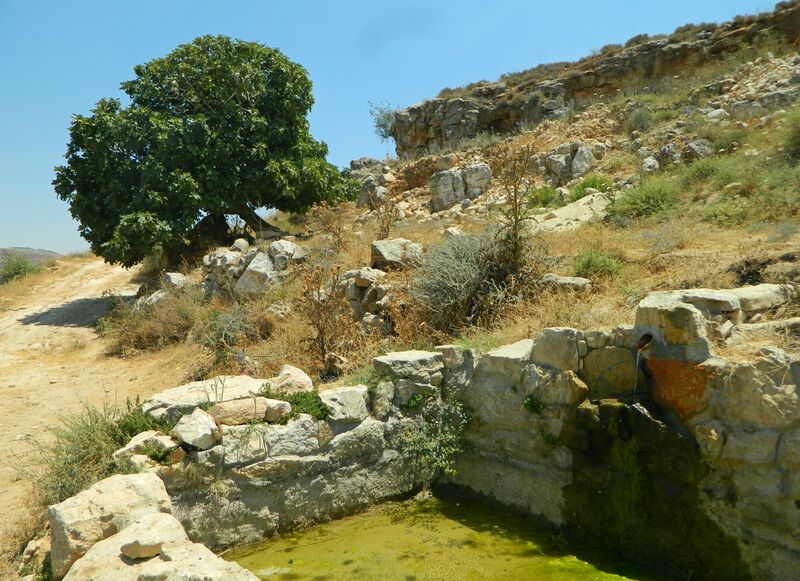 The second portion of this blog post, Kever Yosef, is located in the city of Shechem which is between Mounts Gerezim and Ebal, some 16 kilometres (10 miles) away as the crow flies. The first ruin I saw as I approached the lookout was a six-foot tower rectangle of rough ashlars, as can be seen above. 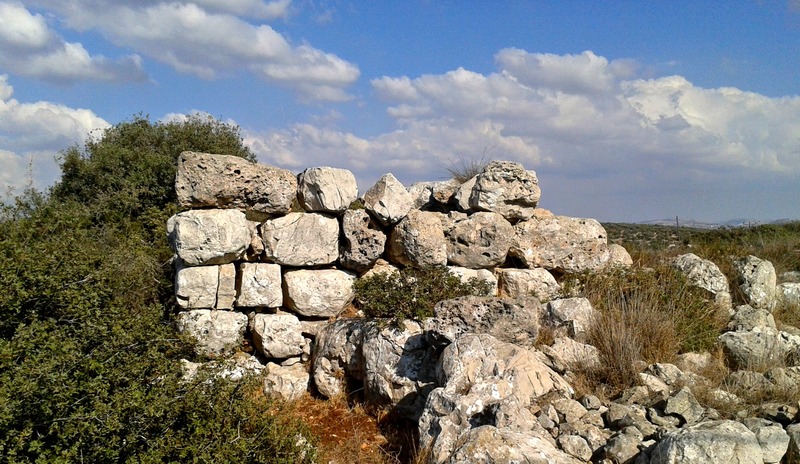 The sign declared the structure as a “shomera” which is the Biblical name for an agricultural watchtower and was comprised of two levels – the lower of stone blocks and the upper a wooden hut. 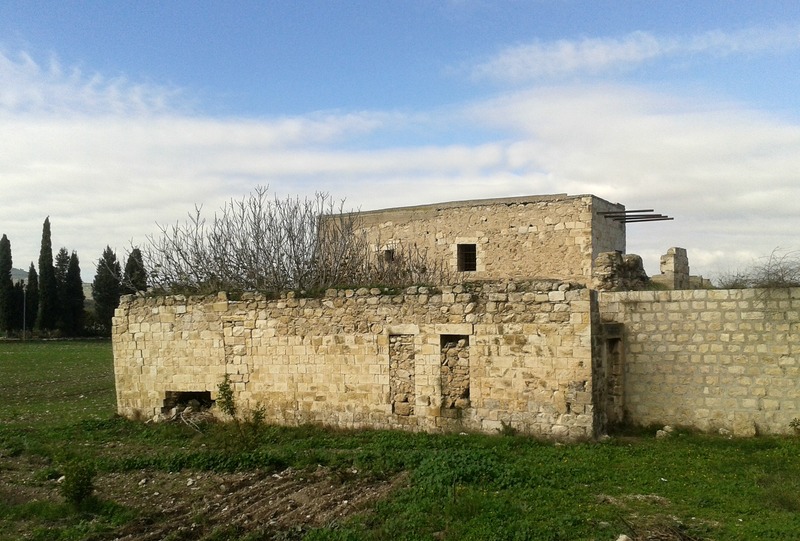 Here is another agricultural watchtower that is unmarked and unkempt right outside the entrance of Yakir Outpost. 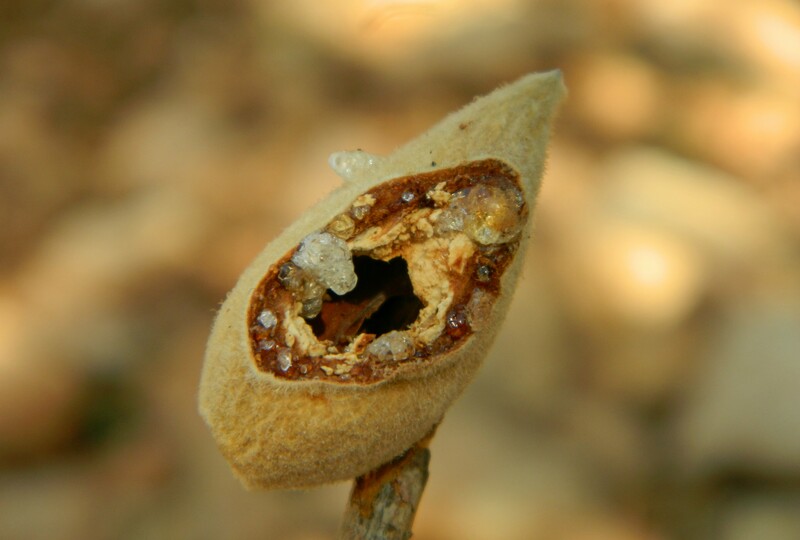 I had been wondering what it was ever since I had first laid eyes on it, now I know. 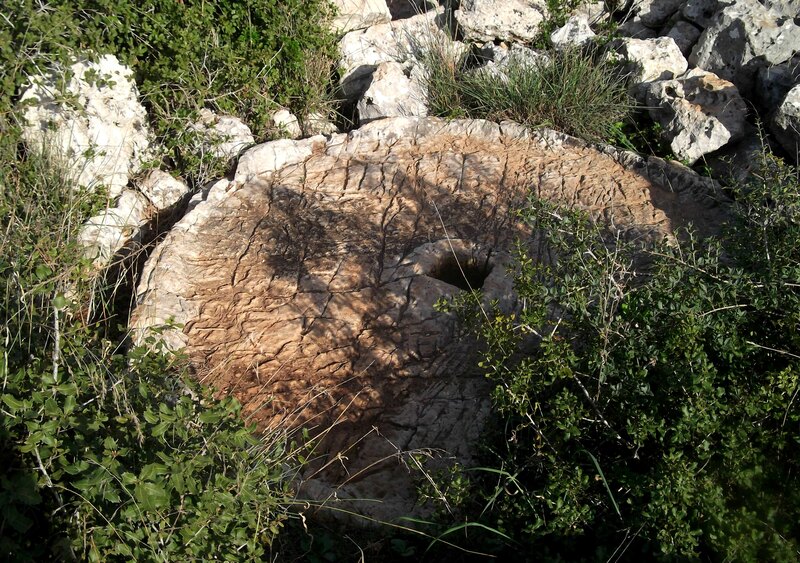 Beside the agricultural watchtower at Mitzpe Oded is a unique textured millstone that was used for coarse wheat and barley grinding. 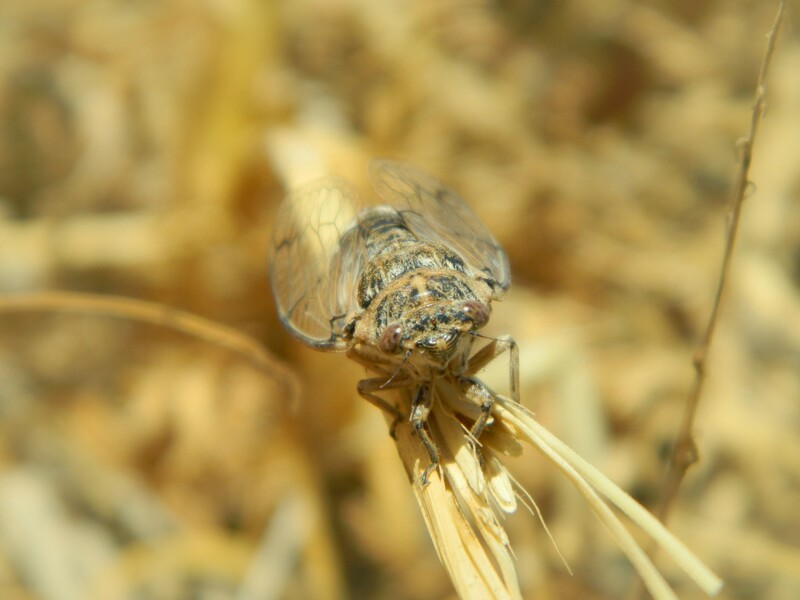 The grain would be ground into a coarse flour used for porridge, as well as for sacrificial purposes. To the north of the millstone there is the base of a square structure and then a confusing little trail down the slope of the mountain. I ventured down a bit, didn’t see anything fascinating and headed back to the outpost. Later on that evening I got a series of calls and found myself driving the Safaron armoured truck to Tapuach Junction for a fun (and not classified) operation. 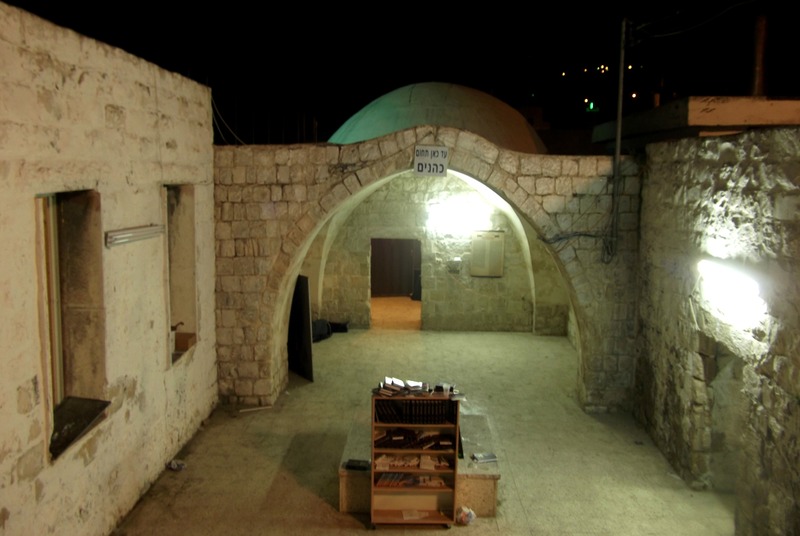 I was to be working with Border Police in Shechem (Nablus) as that night was predestined to be the night when the IDF allows Israeli visitors to Kever Yosef (Joseph’s Tomb) located in the heart of Shechem. Driving in one of many armoured military convoys, we entered the city and headed for Kever Yosef on the edge of the Balata refugee camp. I was a little surprised that we didn’t get any stones thrown at us, but figured we’d probably get stoned later on that night. I parked my large vehicle blocking the north-west access alley (see map) and with the entire plaza area locked down and secure we prepared for the busloads of visitors. This was all an eye-opening experience for me and I enjoyed every minute of it. 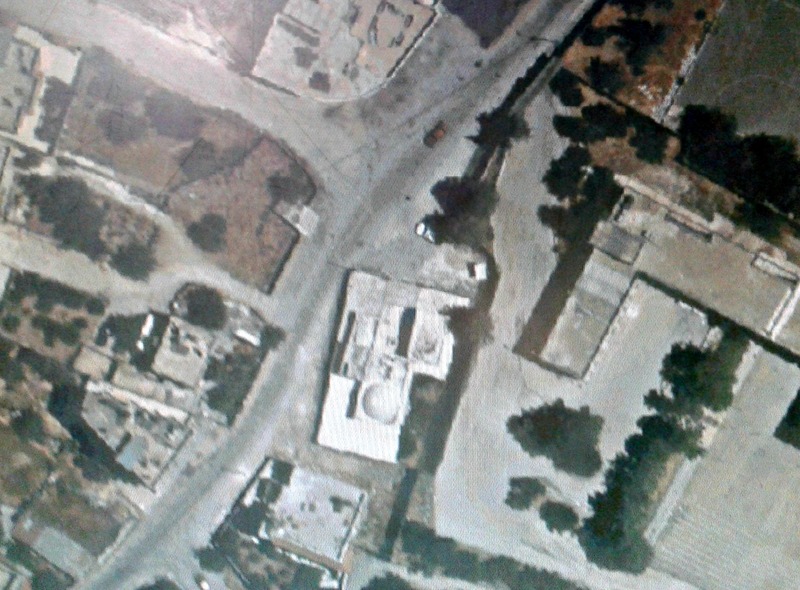 In this panoramic of the “plaza” area just outside the tomb complex, the buses come from the street on the left side while behind me and to the right are completely secured and blockaded by soldiers and military vehicles. 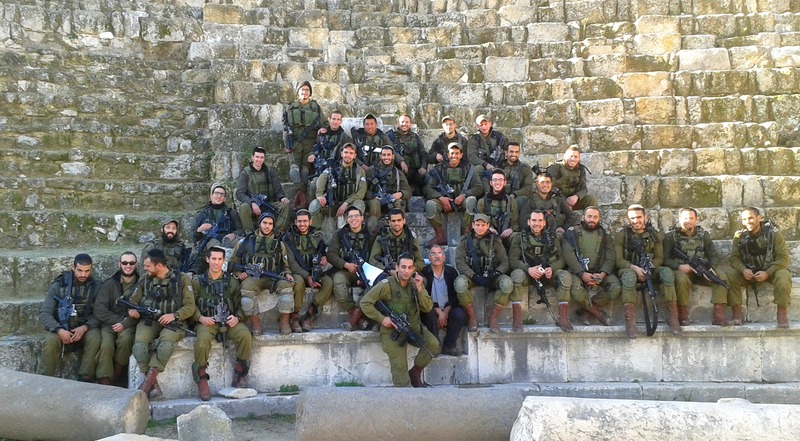 I was fortunate enough to partake in the inner circle of defence, so I was able to visit the site rather easily. The first batch of buses came and the visitors streamed into the complex, eager to seize a prime praying location as close to the tombstone as possible. Eventually I made my way into the domed chamber but the sheer multitude of people discouraged me. 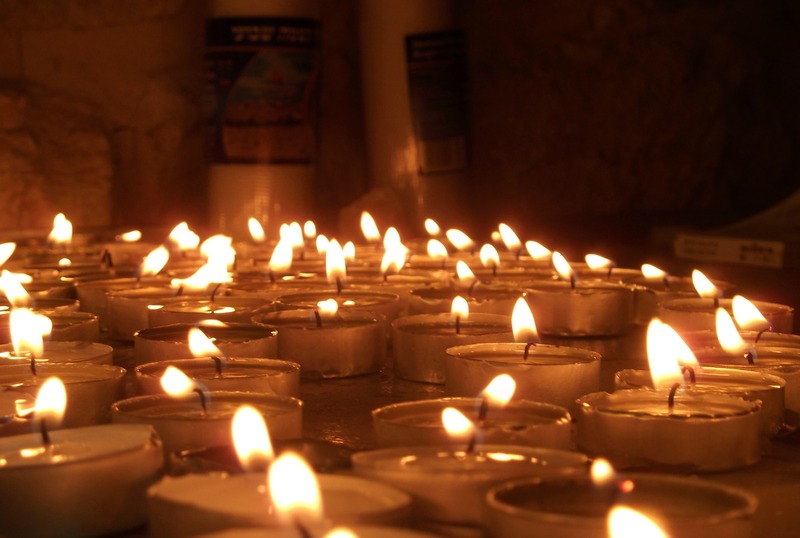 Someone offered me a memorial candle to light, and so I did, lighting it in a niche that had crude swastikas scrawled on the concave wall. 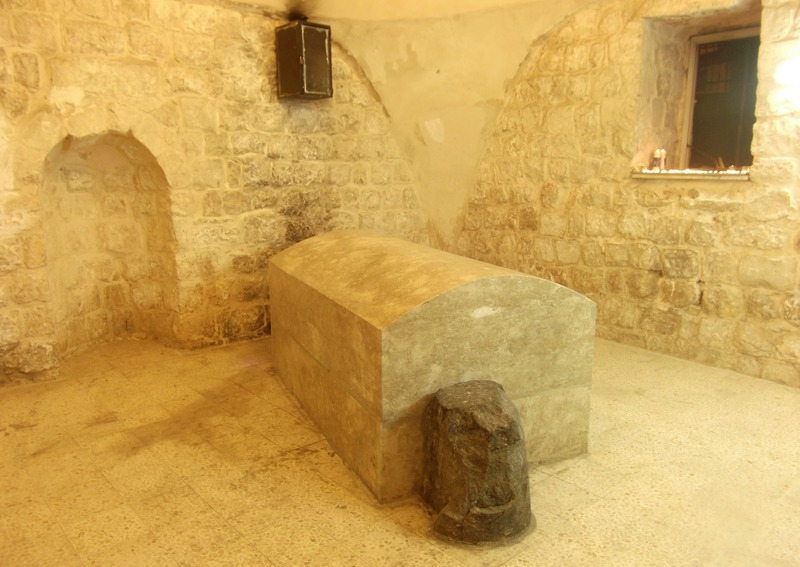 The history of Kever Yosef is pretty hairy, and despite considered a holy site for Muslims, finds itself the victim of destruction and hate crimes. I’m not sure how the situation usually is during these late-night visits, but that night was extremely quiet. After about 90 minutes or so, the visitors were herded back onto the buses so that the second batch could come. In between groups, there was a nice quietness about the place and I was able to take a photo of the site without people being in my way. 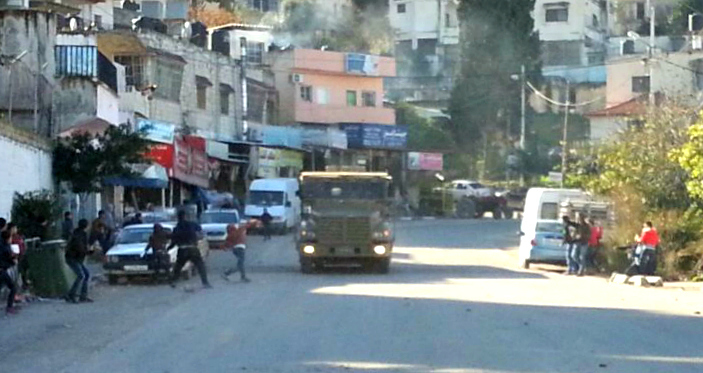 When the last of the soldiers and Border Police were aboard their armoured vehicles, we drove back out of the troubled city of Shechem, fully expecting an onslaught of rocks and worse. Again, we passed through unscathed. 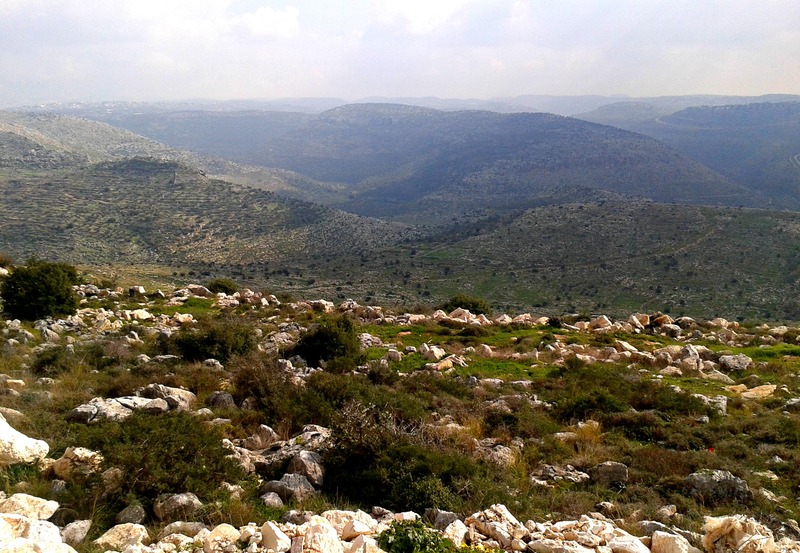 I’m still astounded at the fact that despite having entered many Palestinian villages and cities, I’ve never once got even as much as a stone thrown at me – what are the odds? 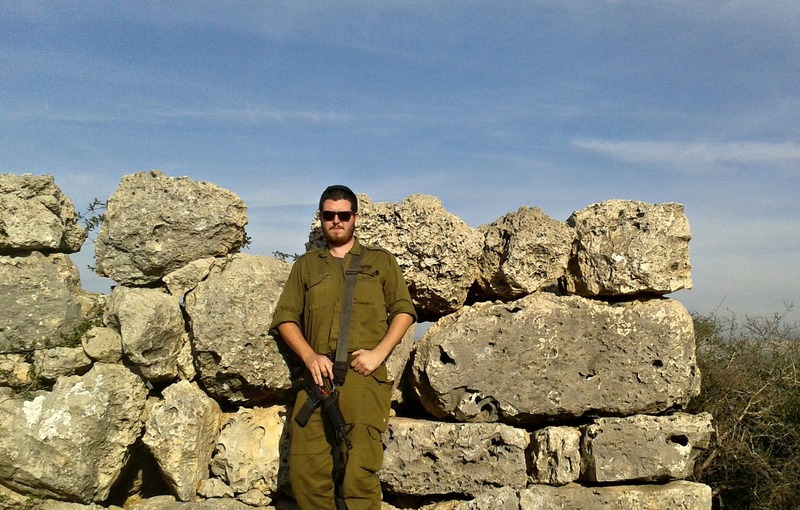 Anyhow, such is life in Israel’s “Wild West” and I hope I get more chances to have blog-compatible experiences so that I can document them here.